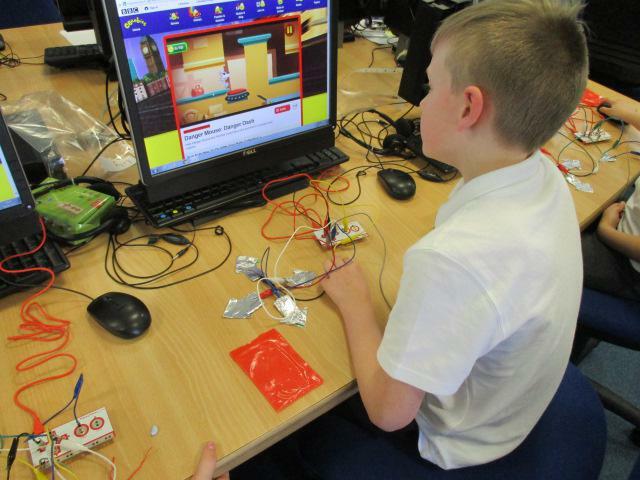 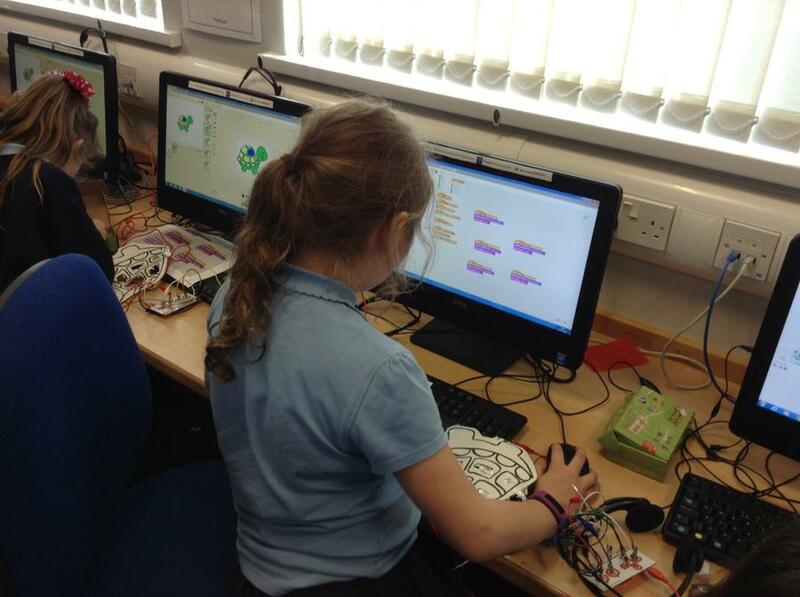 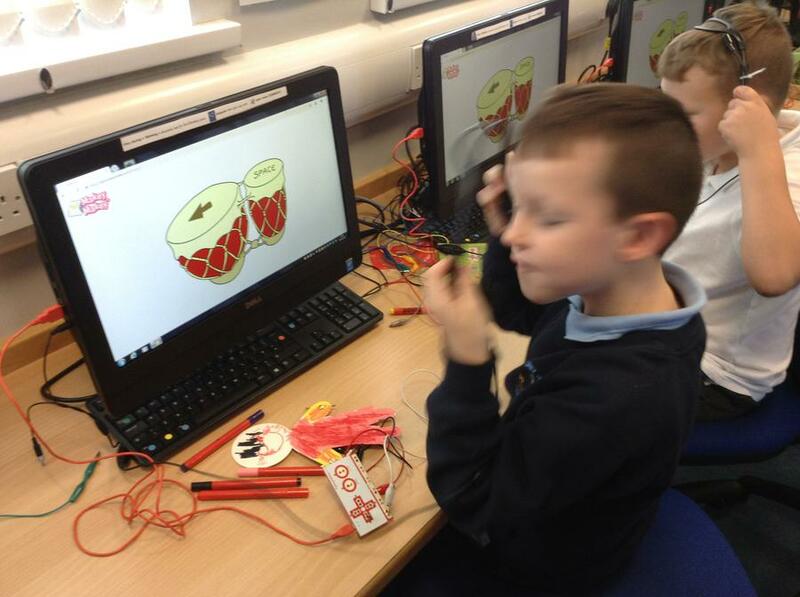 MaKey MaKey is an invention kit that will turn everyday objects into touchpads and combine them with the internet. 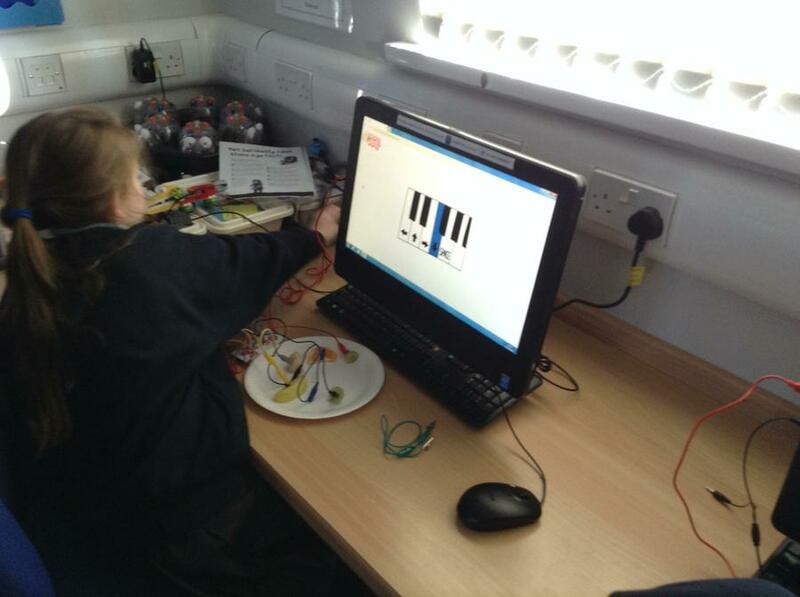 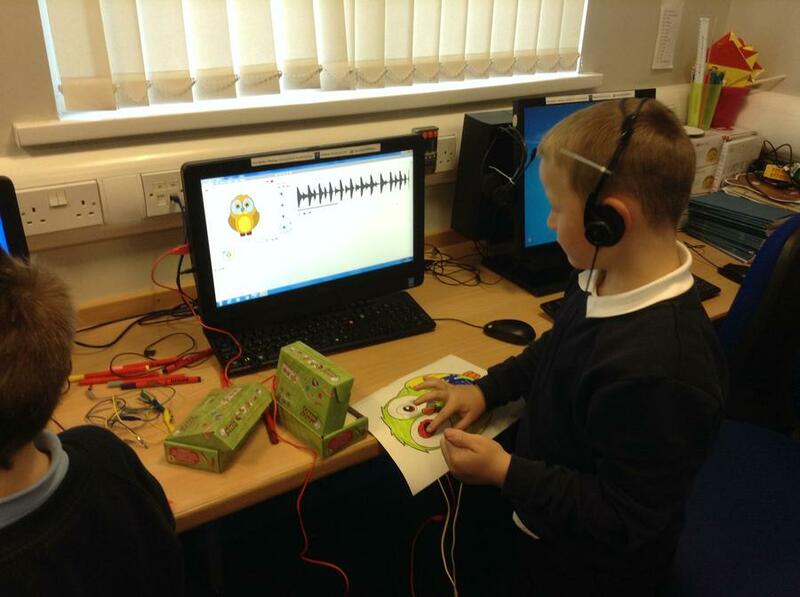 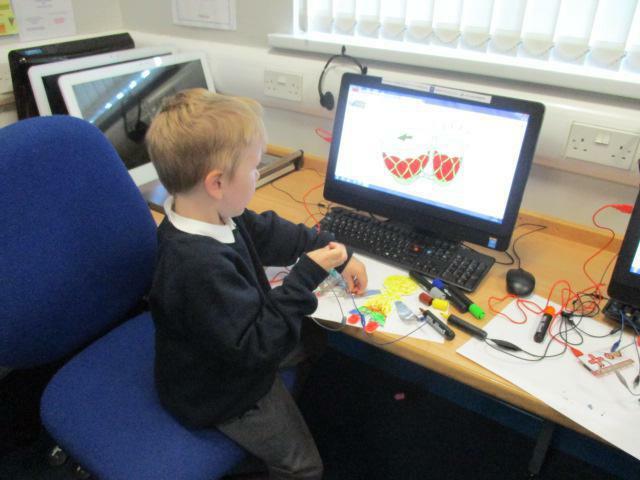 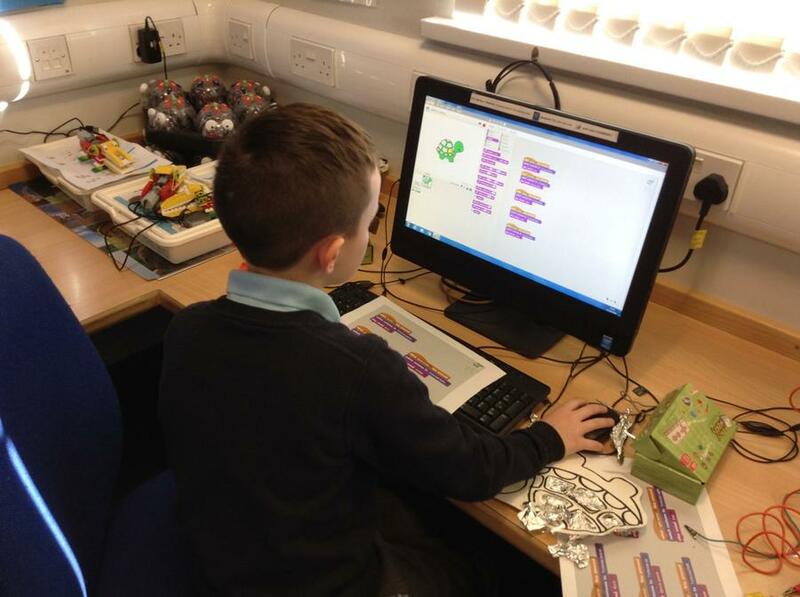 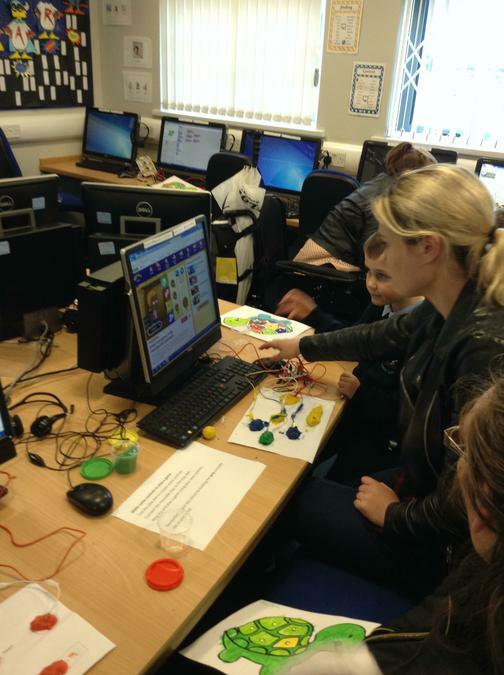 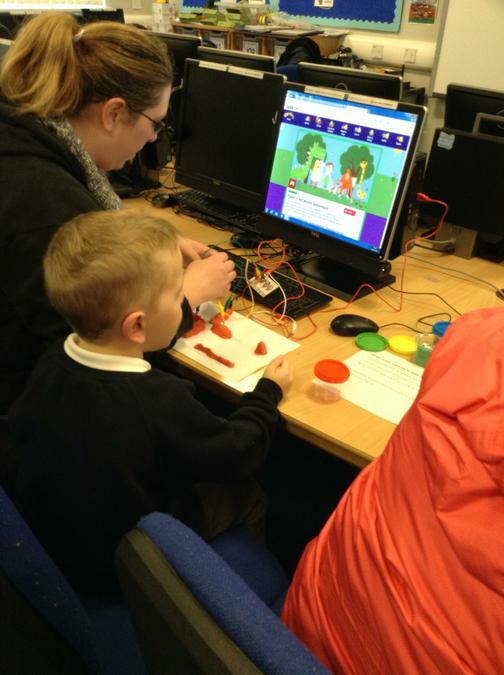 Using the Makey Makey kit, Ryan connected crocodile clips to fruit and veg and played on the interactive piano. 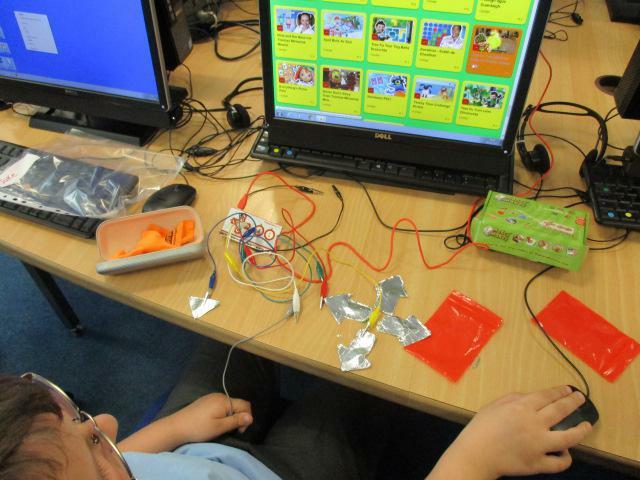 Makey Makey Club started again this week. 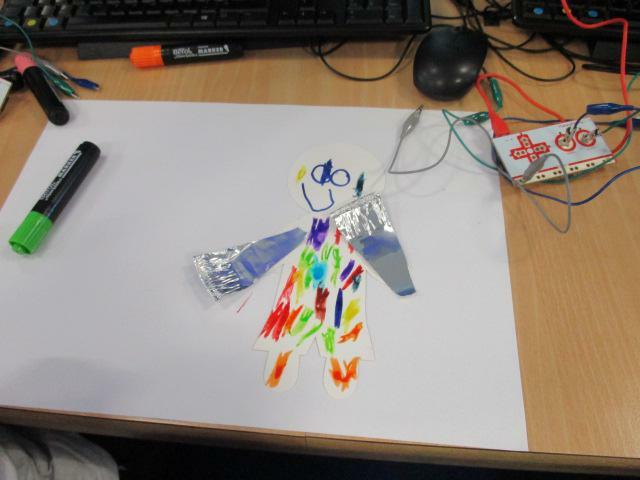 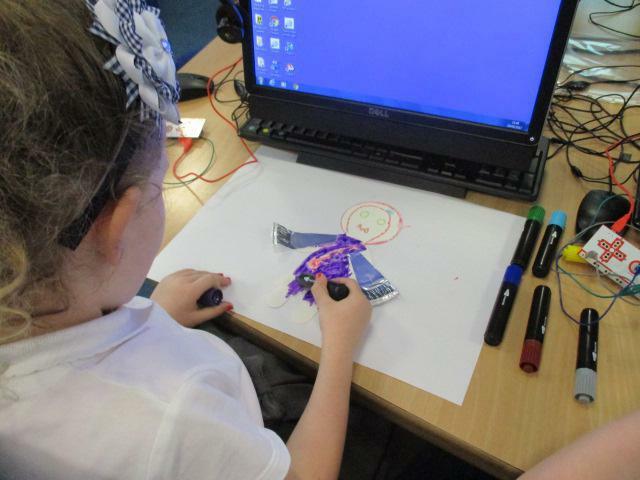 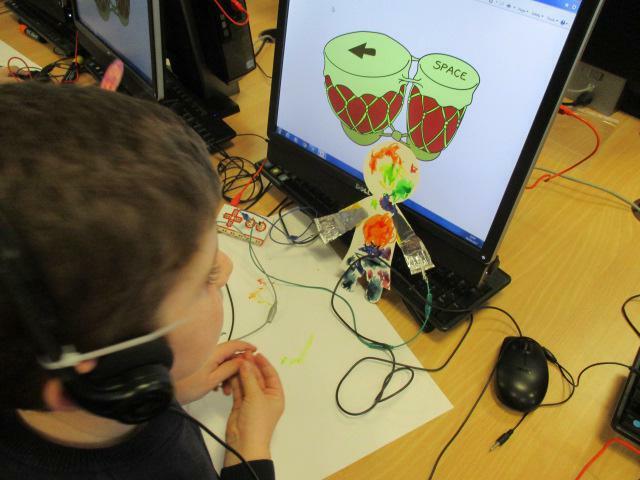 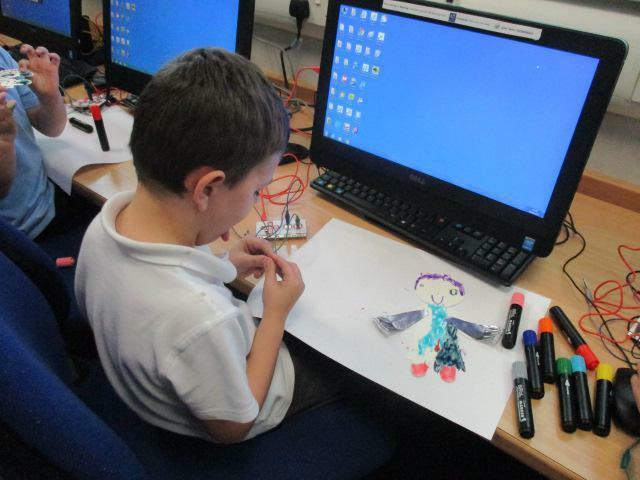 Children decorated a person to look either like themselves or someone else and then they connected the circuit board and wires to split pins in order to get the person to play the Bongos. 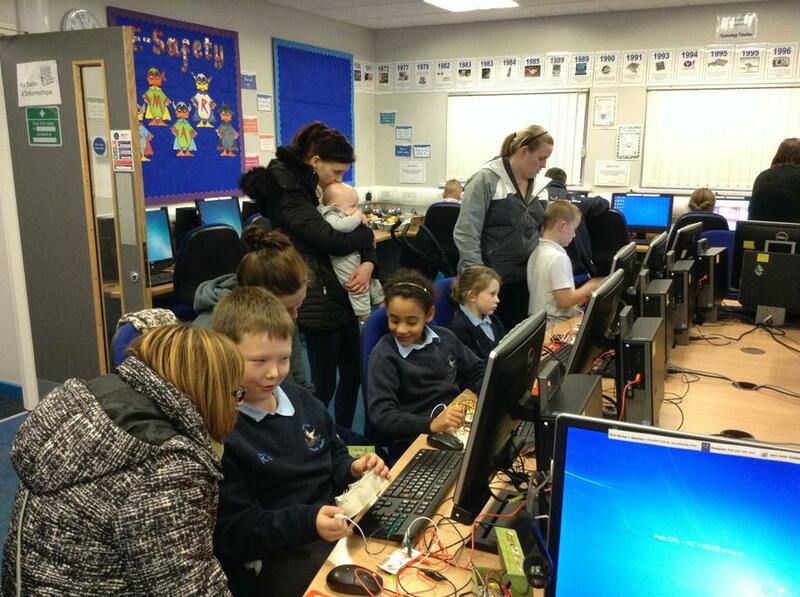 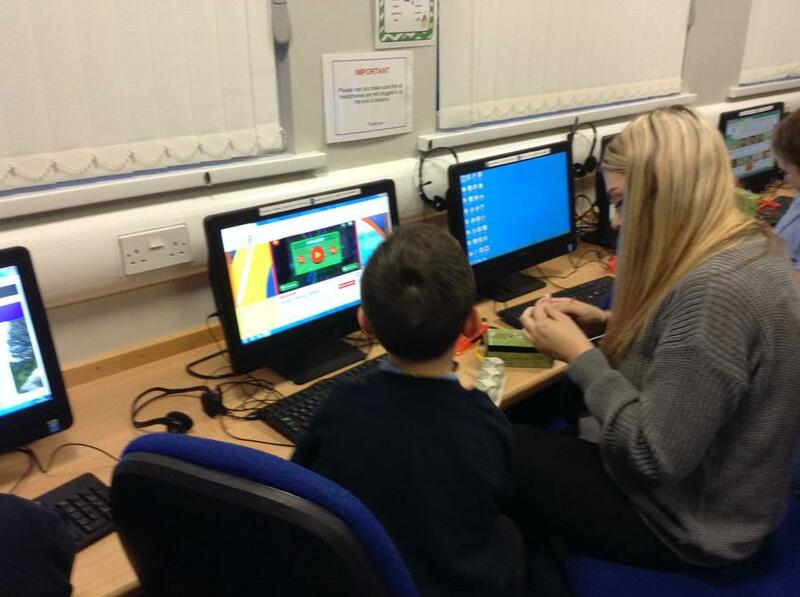 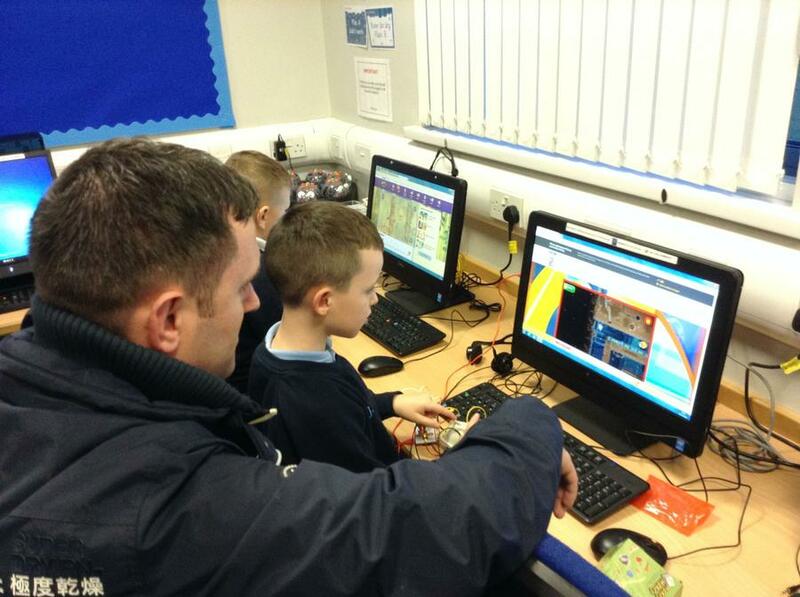 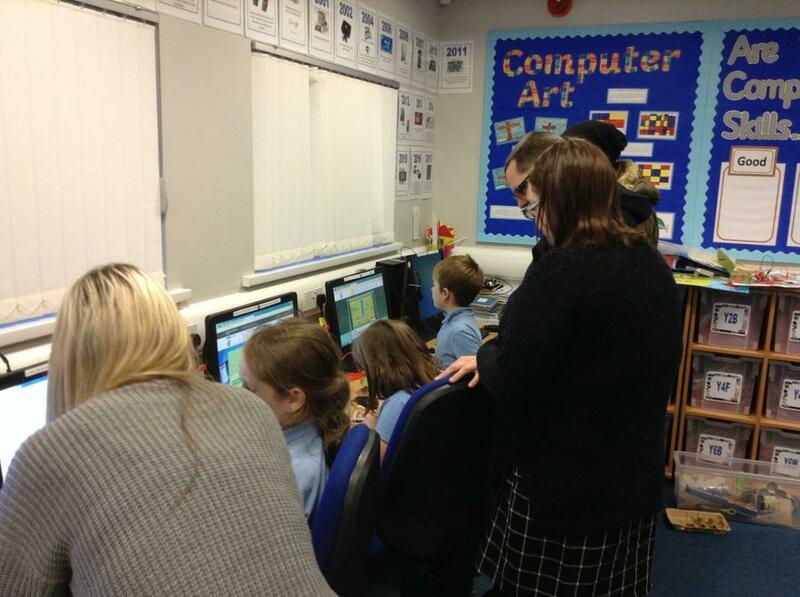 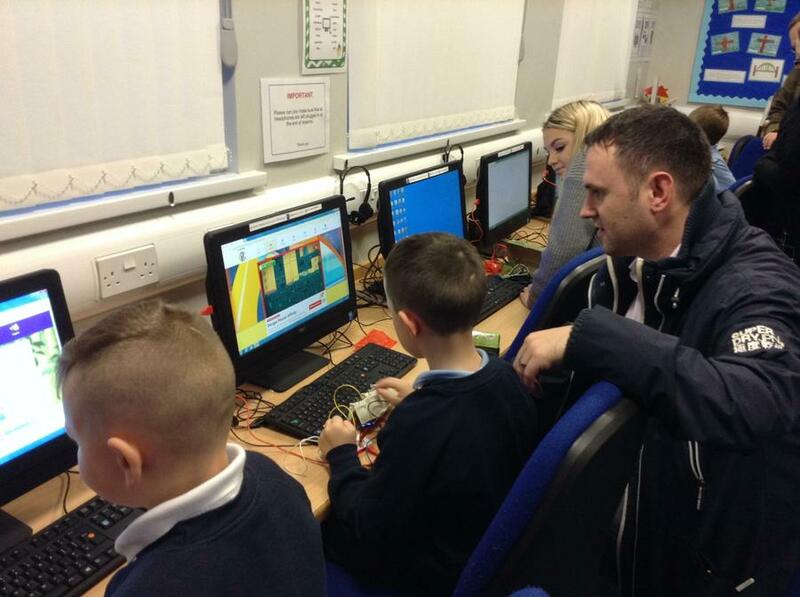 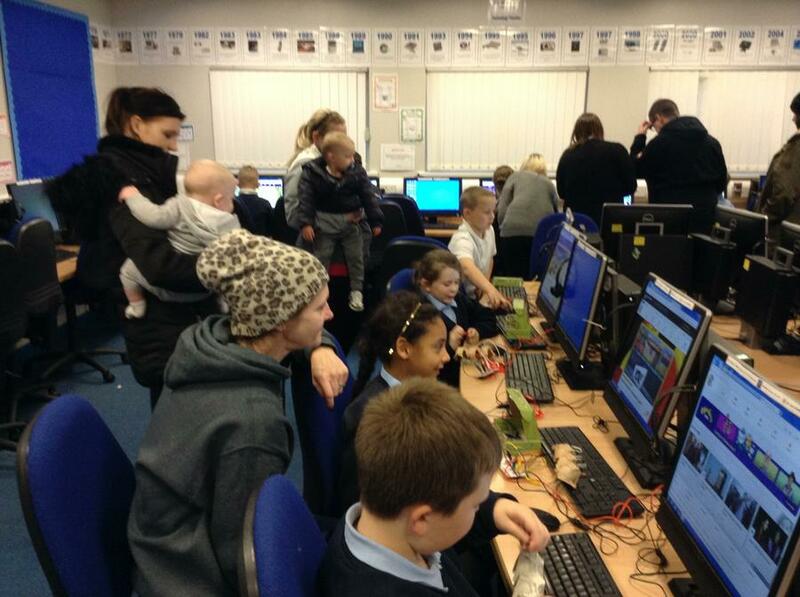 In today's session we invited the parents/carers to join us and see what we have been doing. 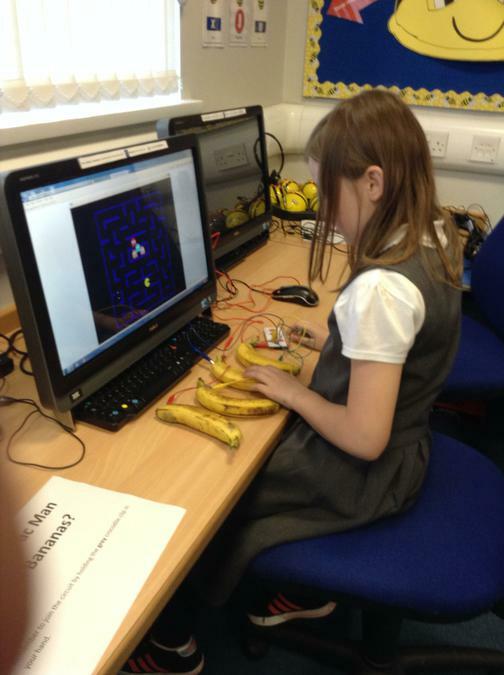 We played Pac Man with Bananas, made Play-Doh game controls and we even made an interactive tortoise. 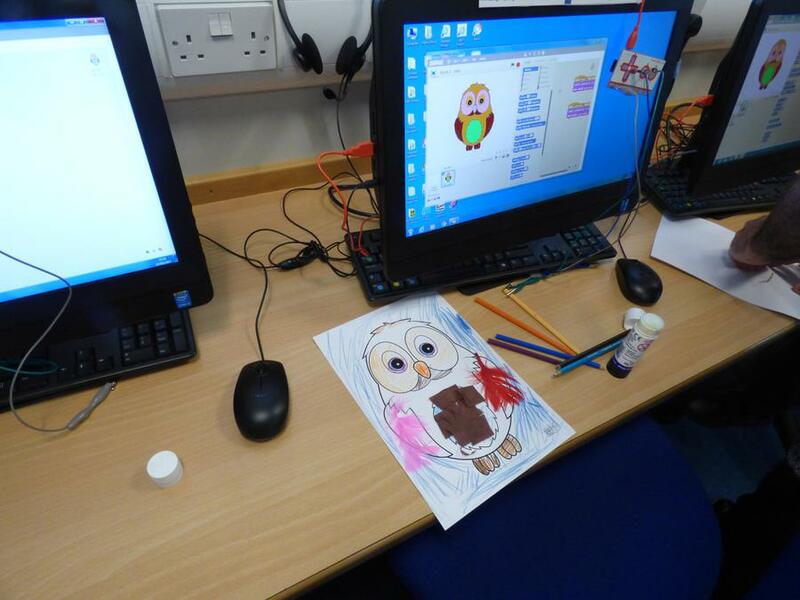 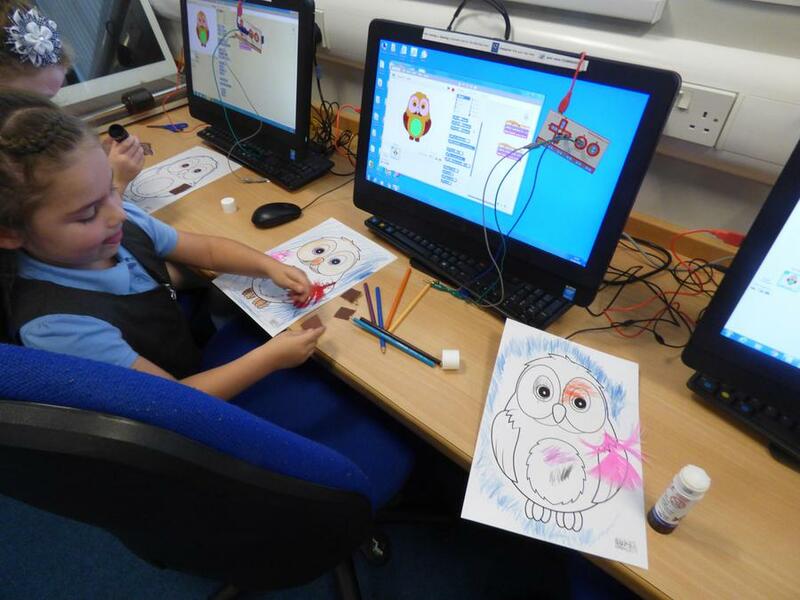 This week we decorated owls with coloured paper and feathers. 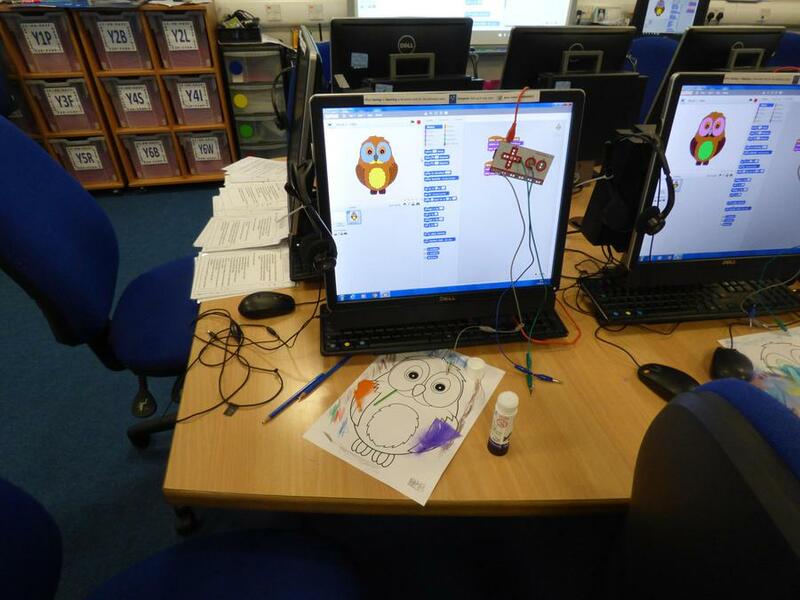 We made the owls eyes interactive by using split pins. 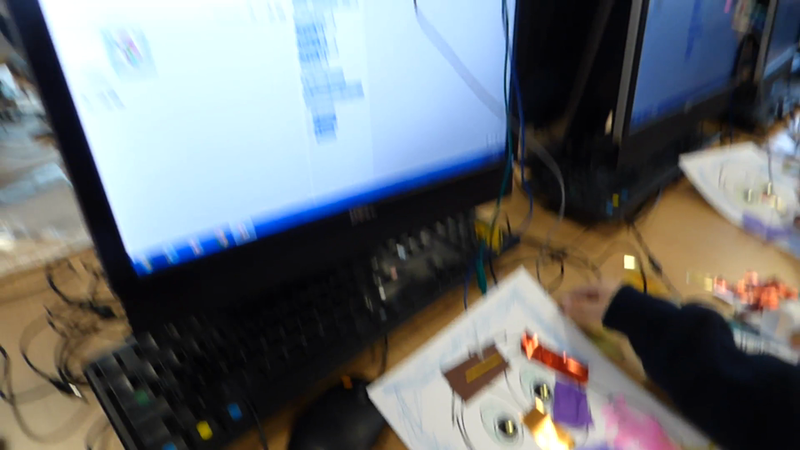 We connected the split pins to the Makey Makey kit and then connected the kit to a simple scratch program. 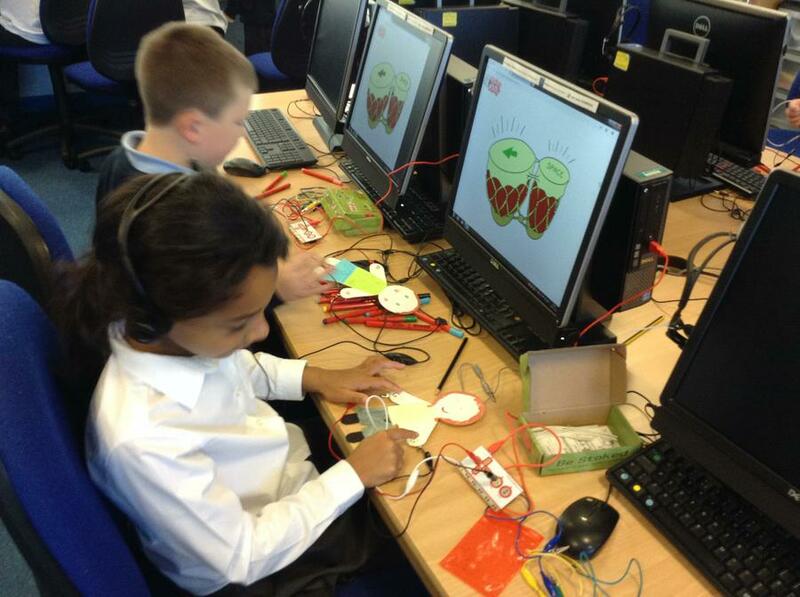 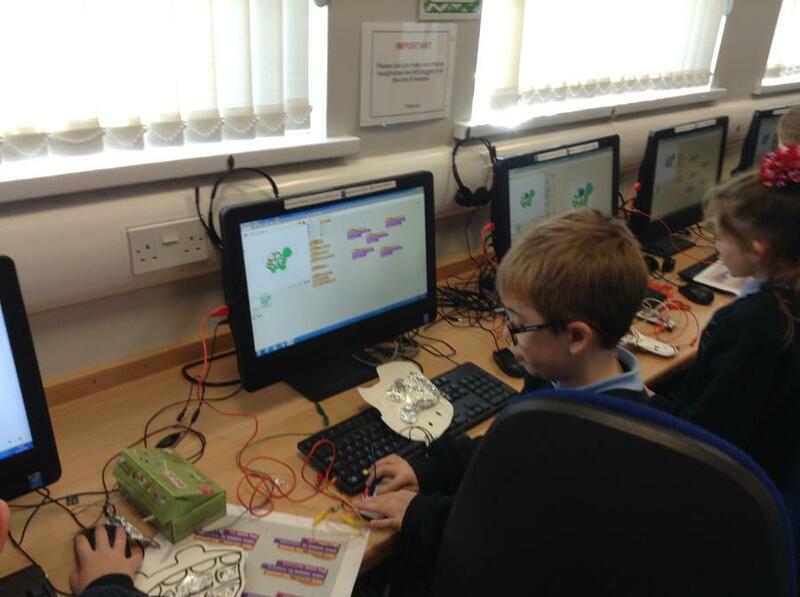 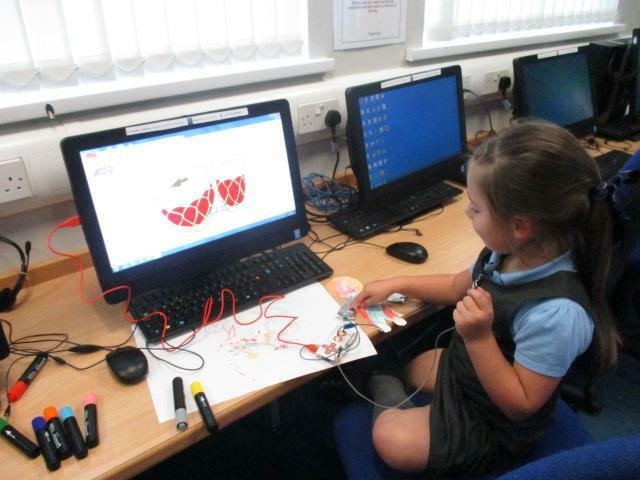 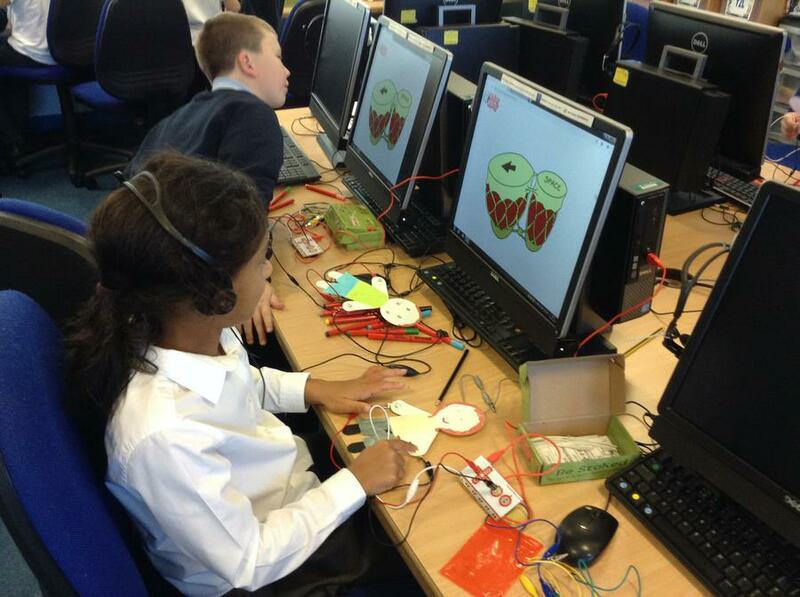 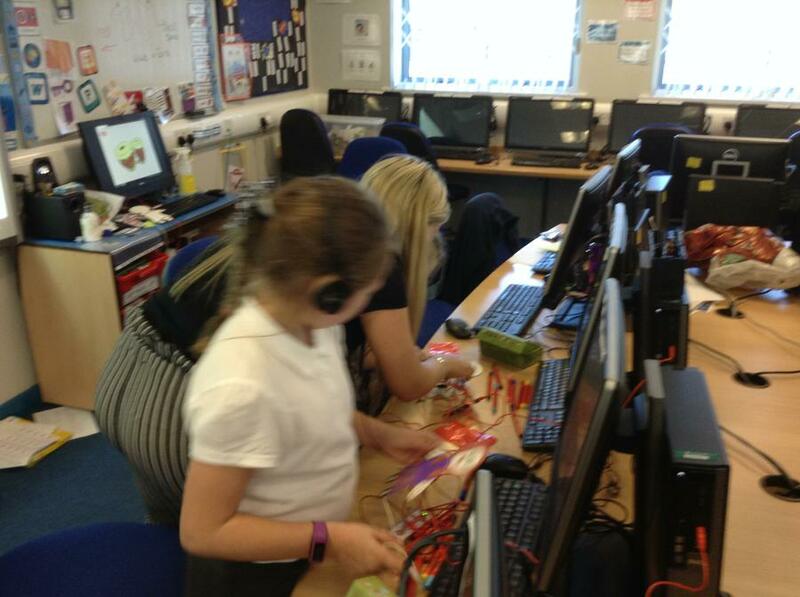 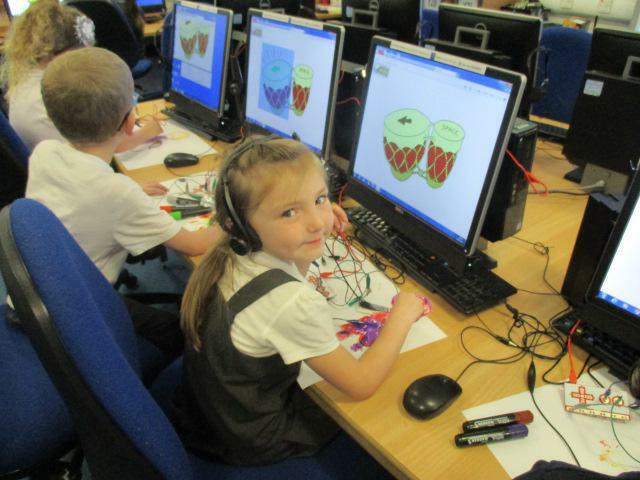 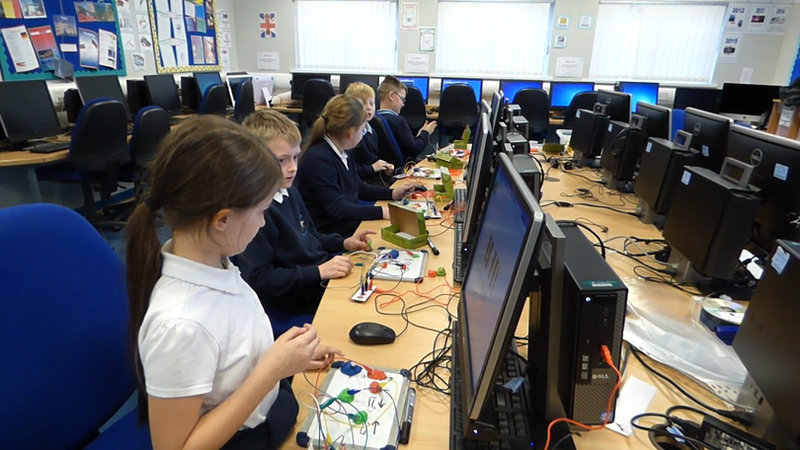 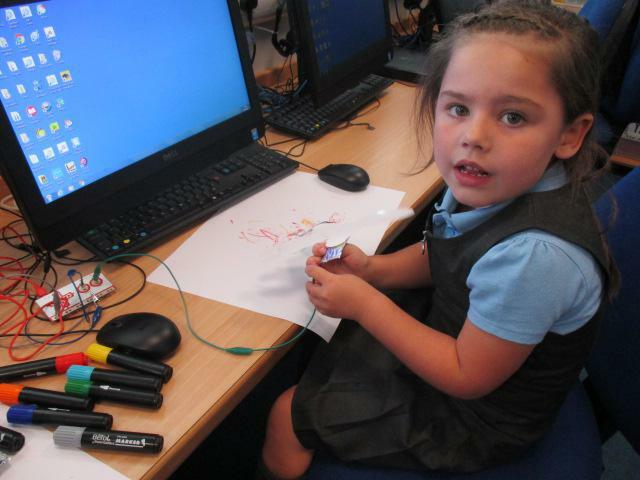 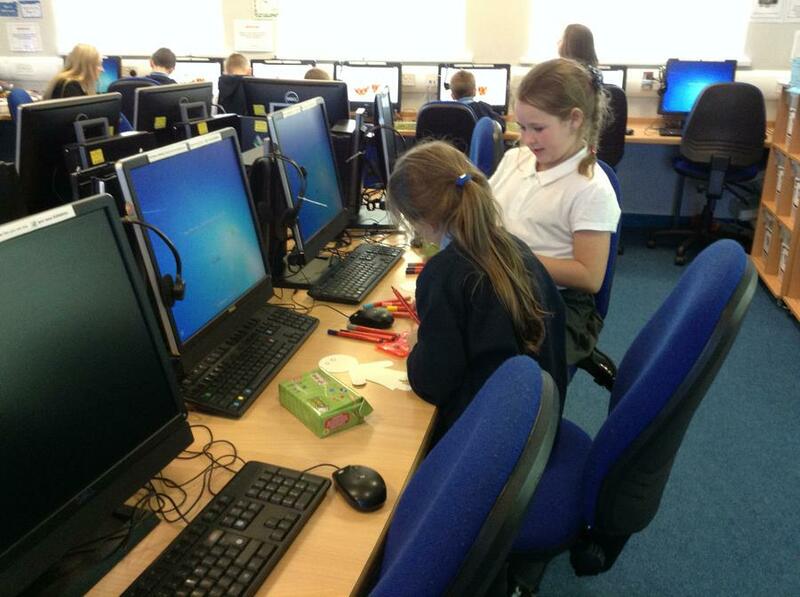 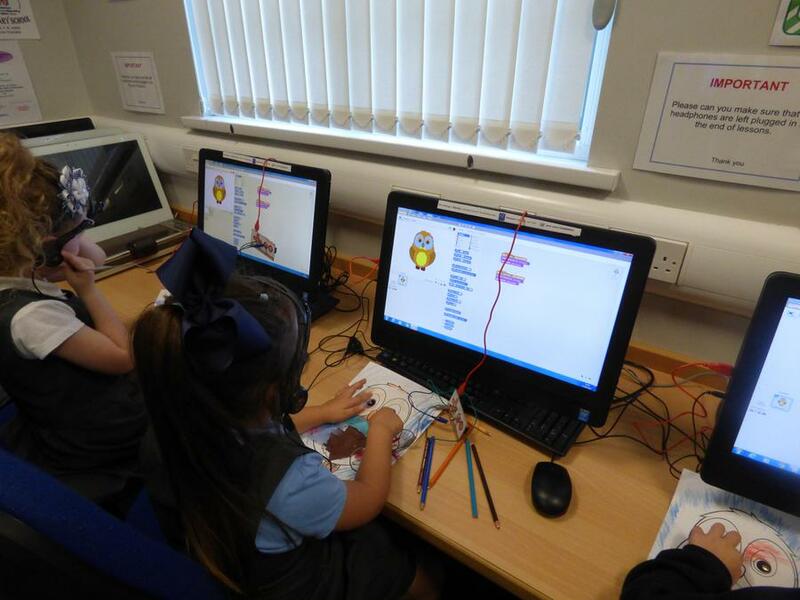 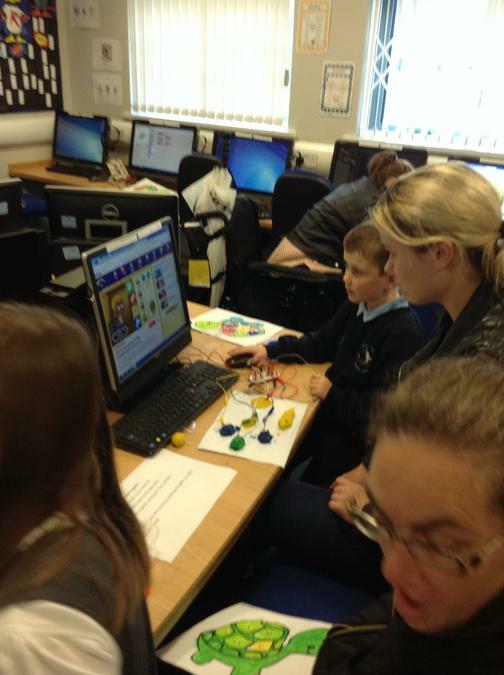 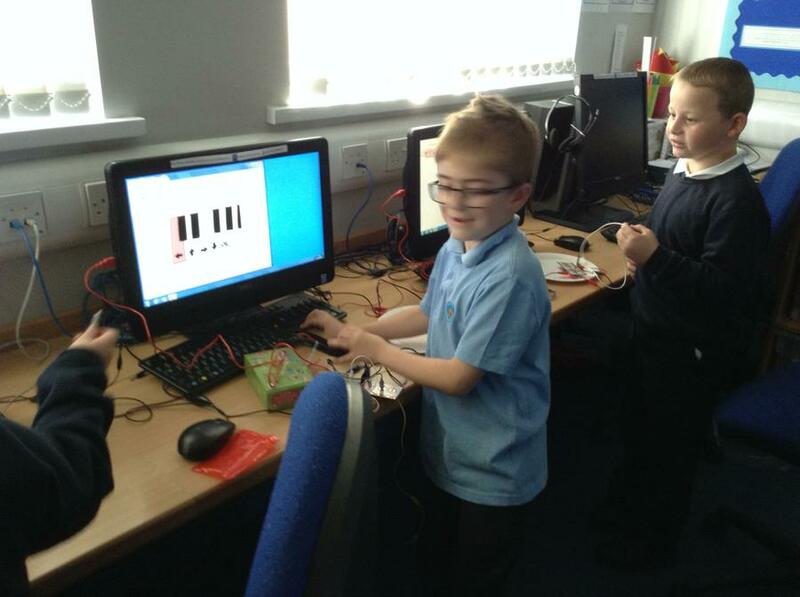 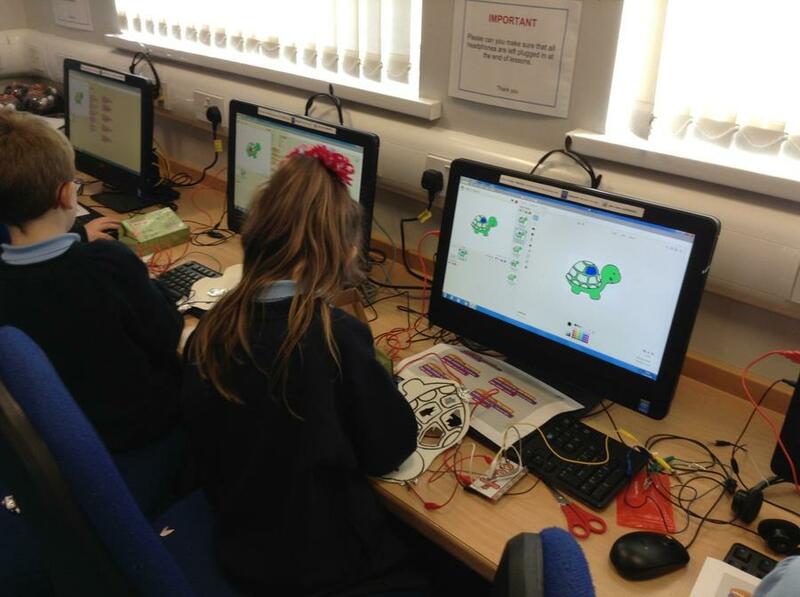 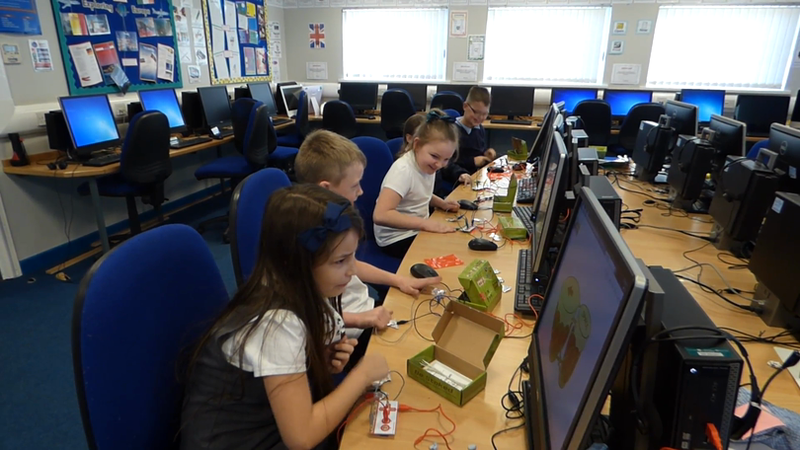 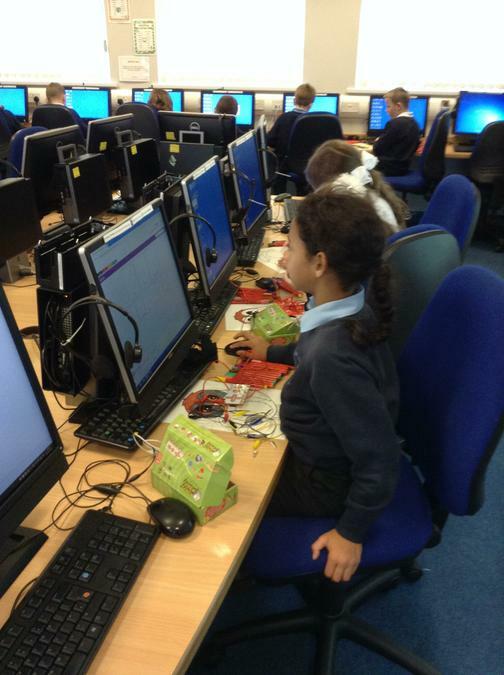 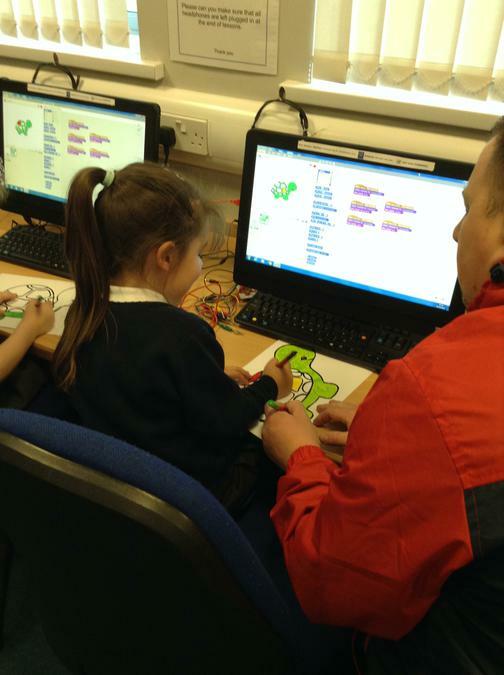 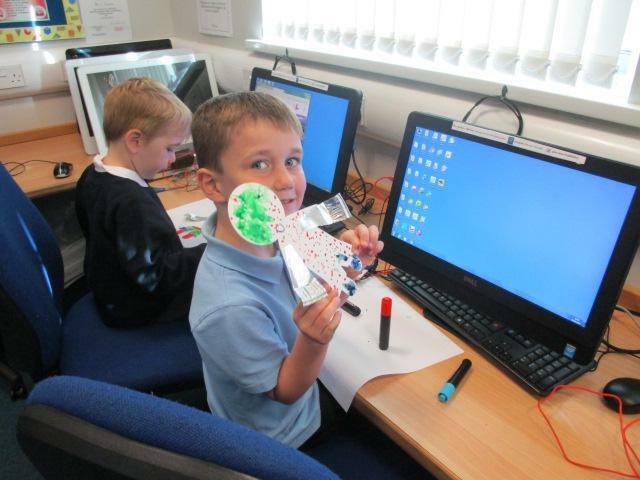 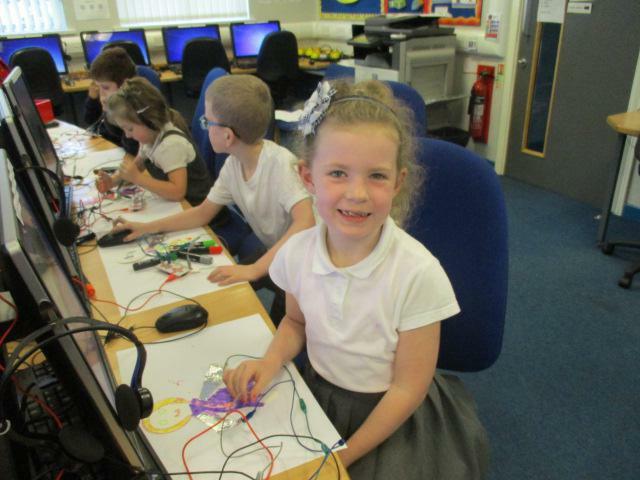 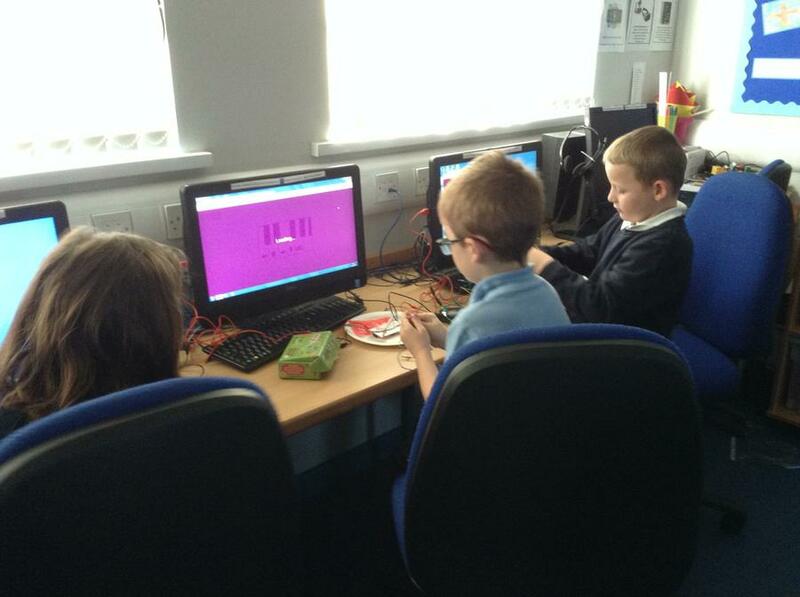 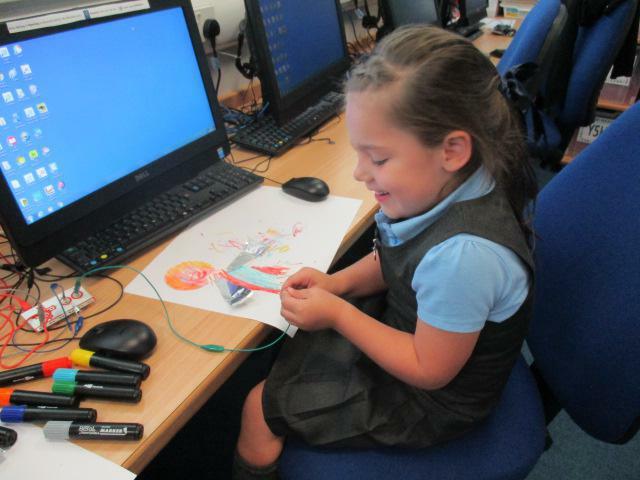 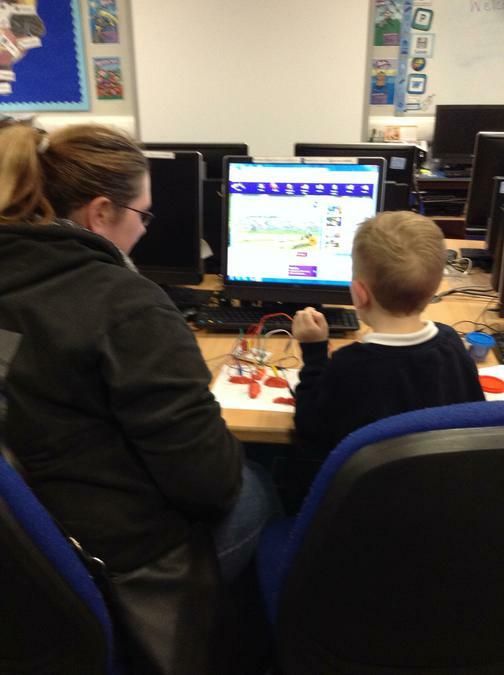 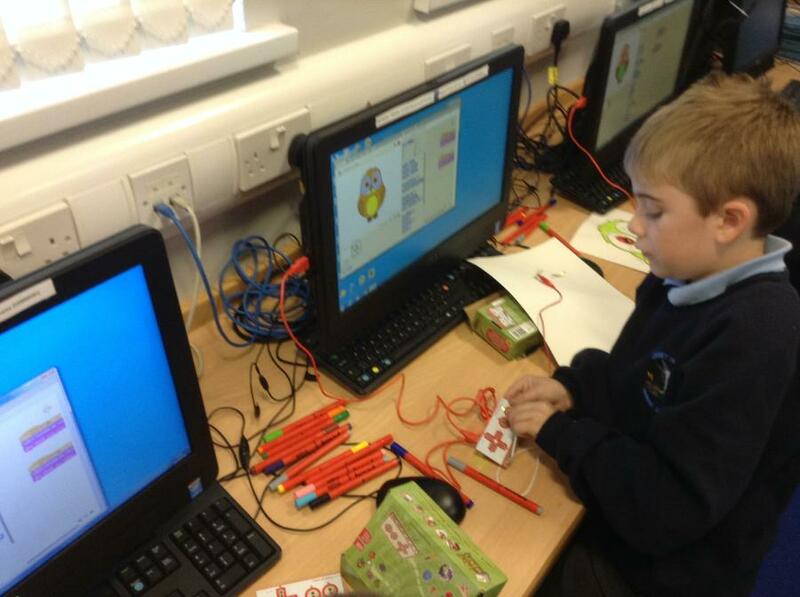 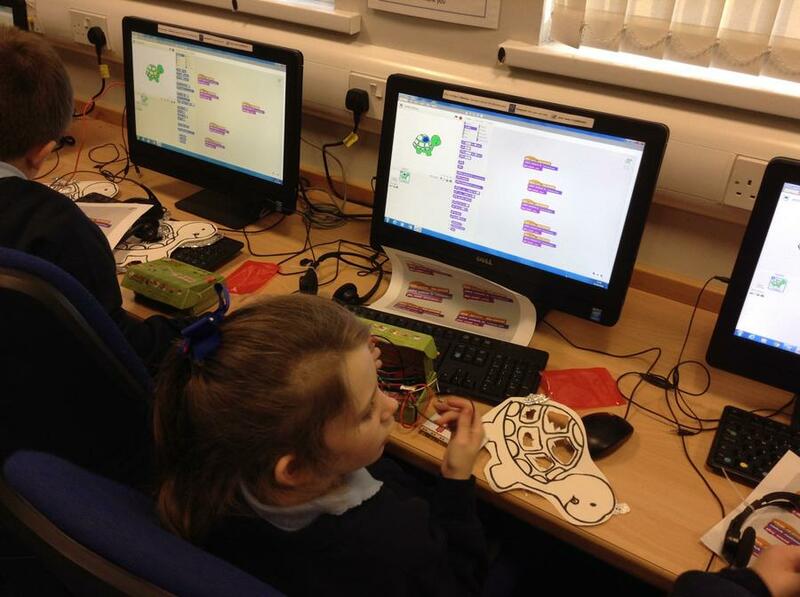 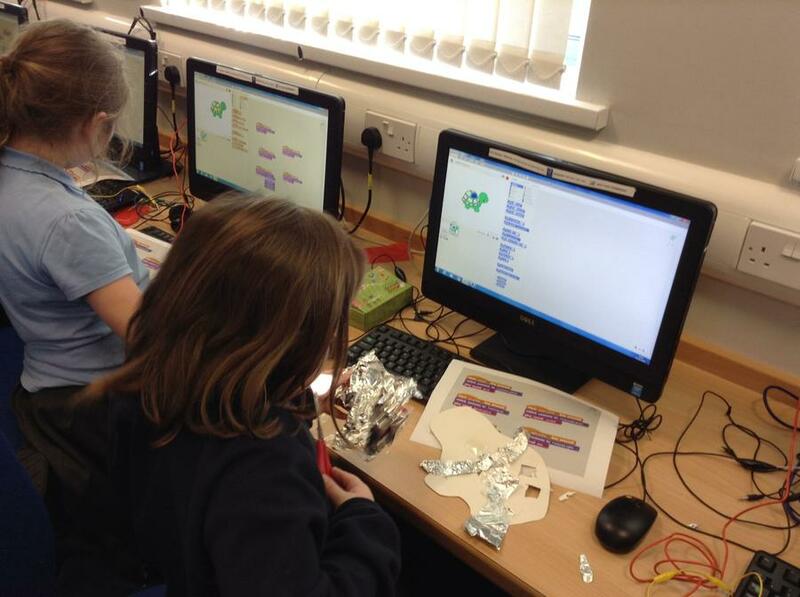 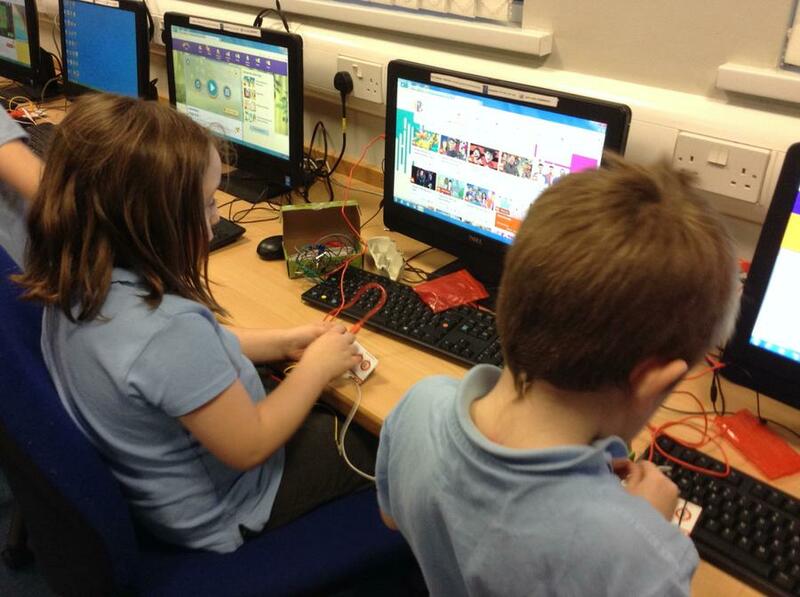 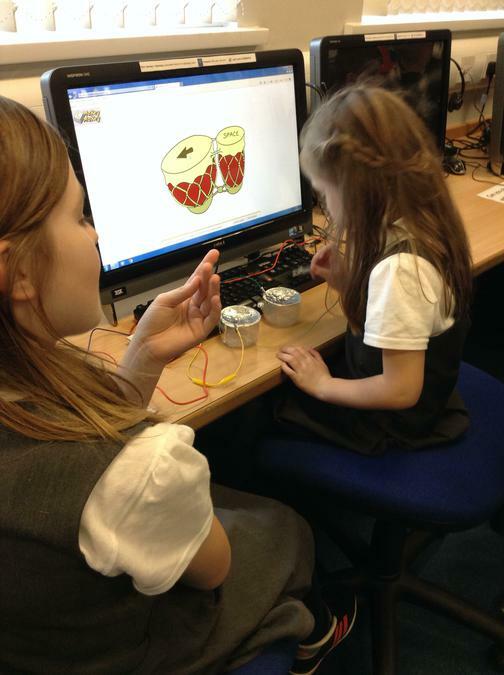 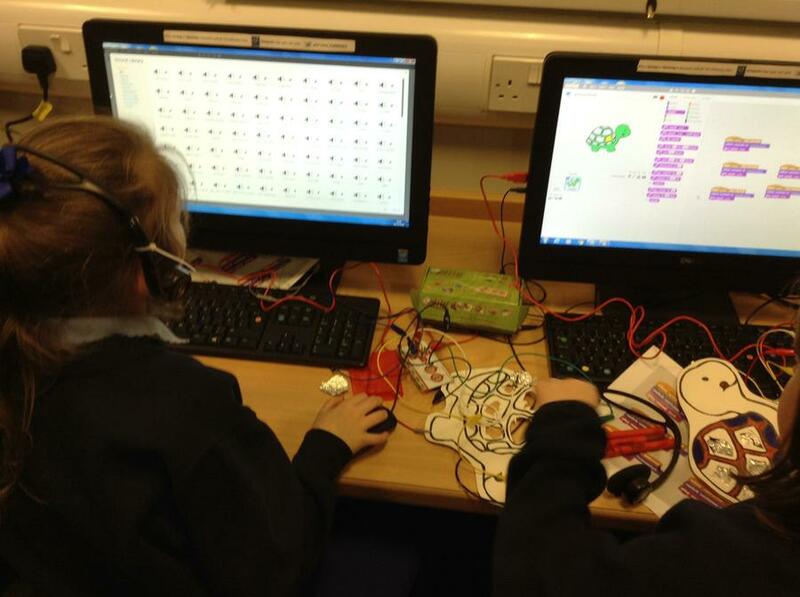 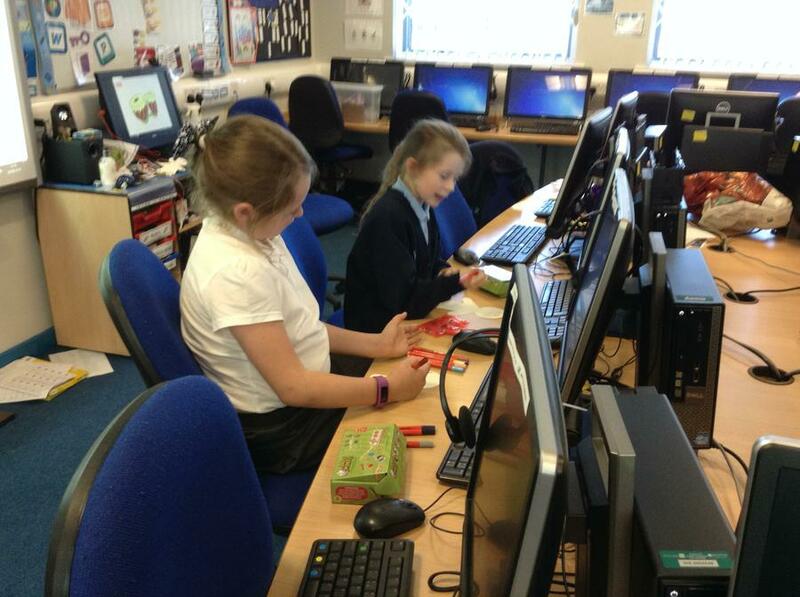 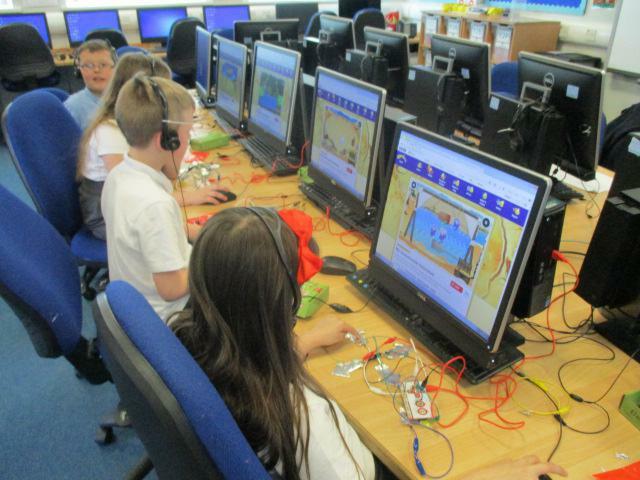 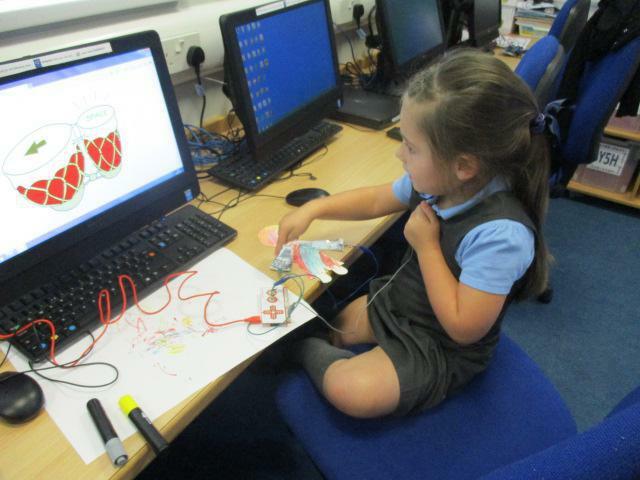 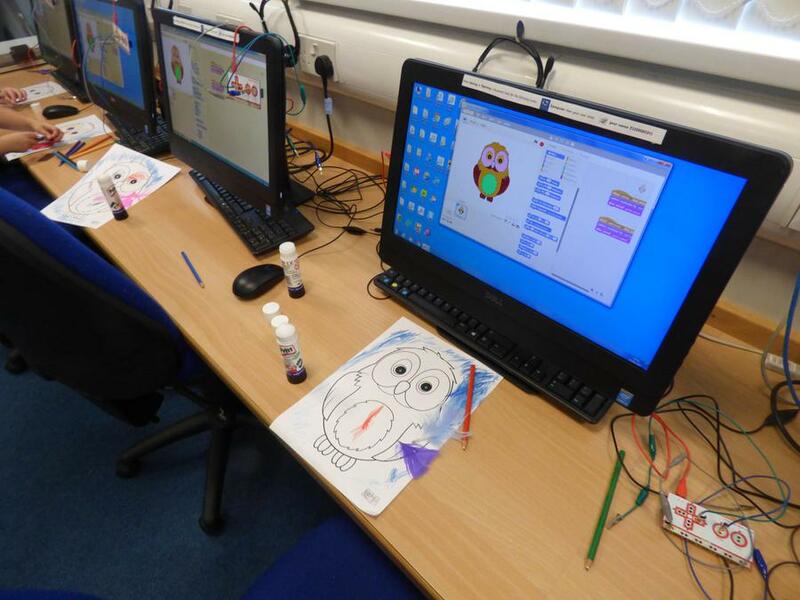 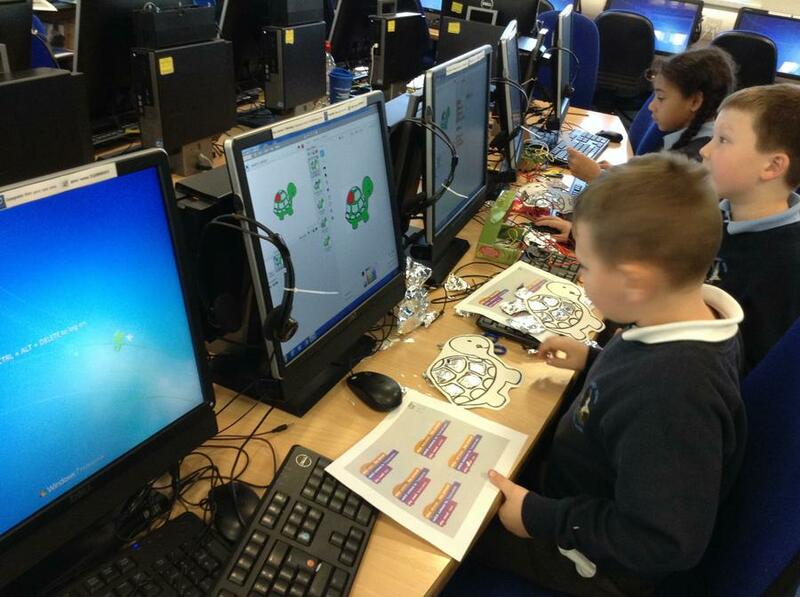 We were pleased to start our MaKey MaKey Club again for our Year 1 children. 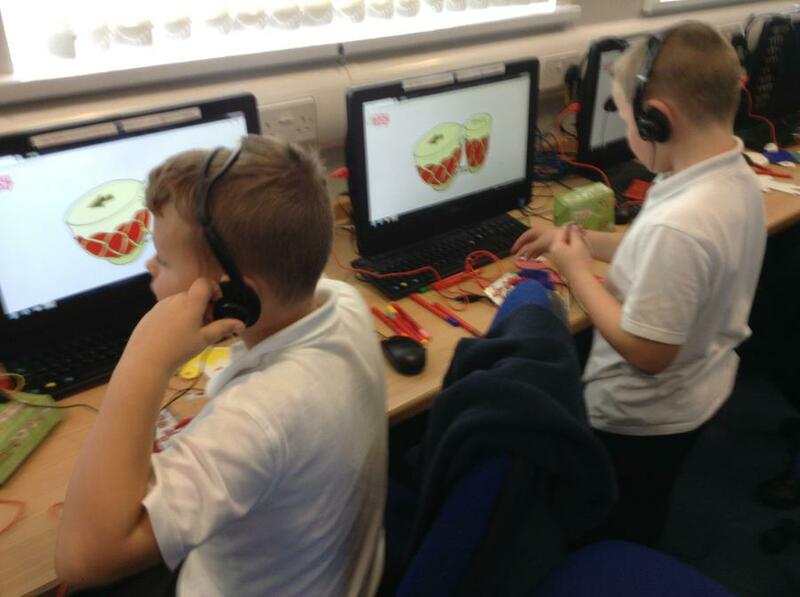 Our first challenge was to play the Bongos. 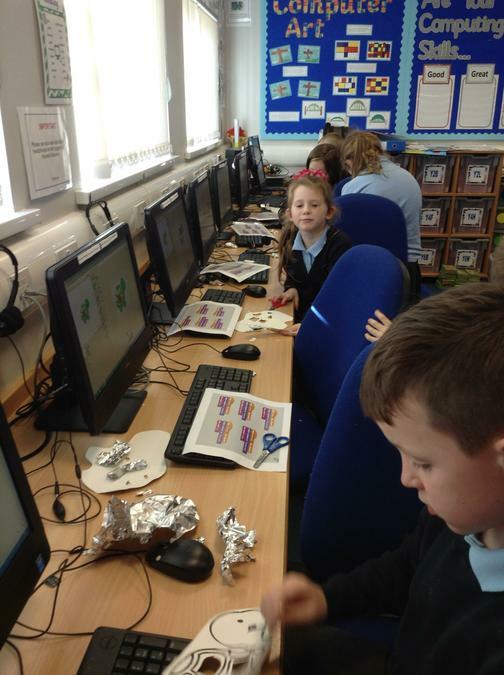 To play the Bongos we had to create some controls, children decorated people and covered their arms with tin foil. 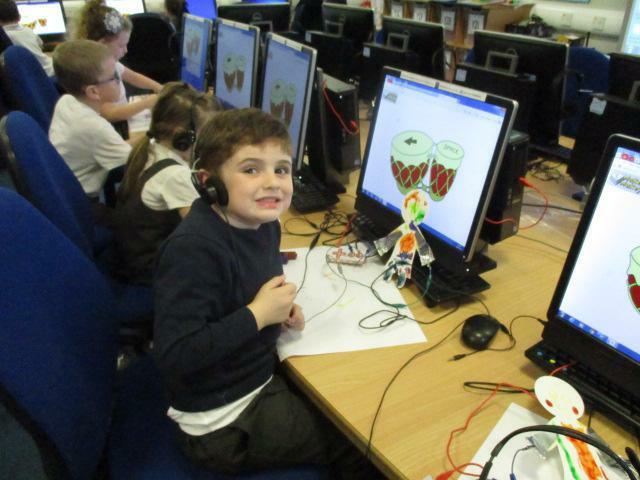 We connected the crocodile clips to the controls they had made and then connected it to the computer. 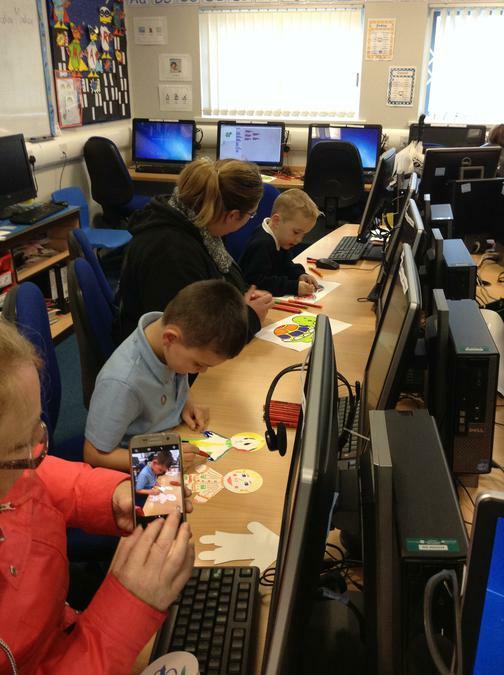 This was our last session, we invited our parents, carers and siblings to come and see what we have been up to over the last 5 weeks. 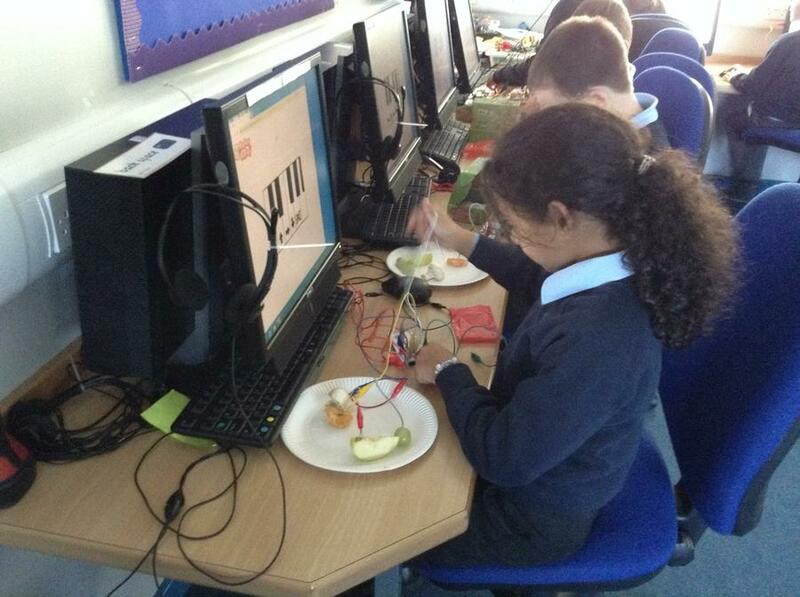 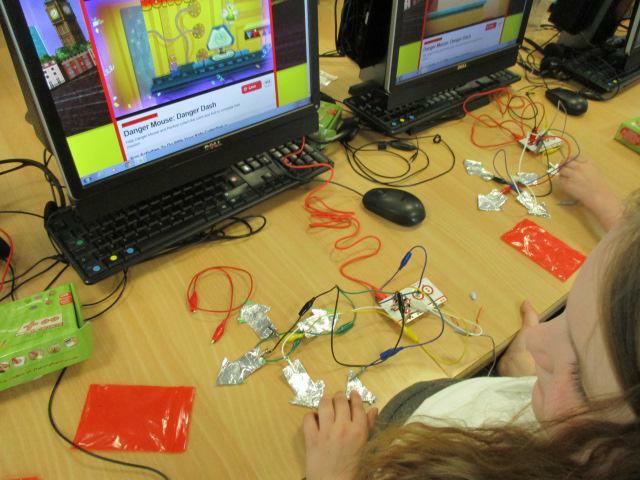 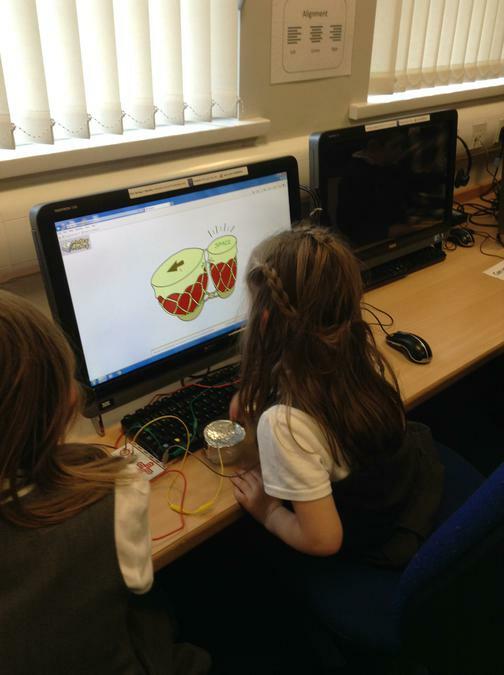 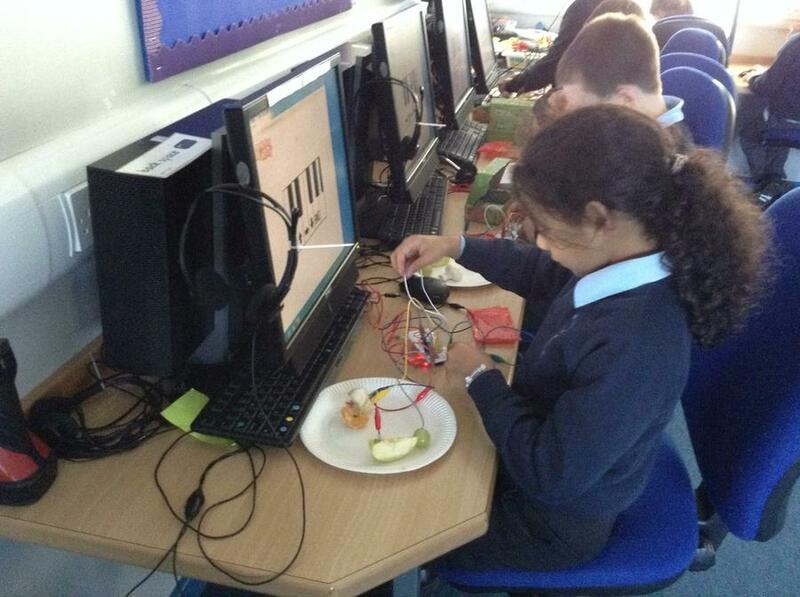 This week we linked the MaKey MaKey up to water, fruit and other things we had made during the other sessions. 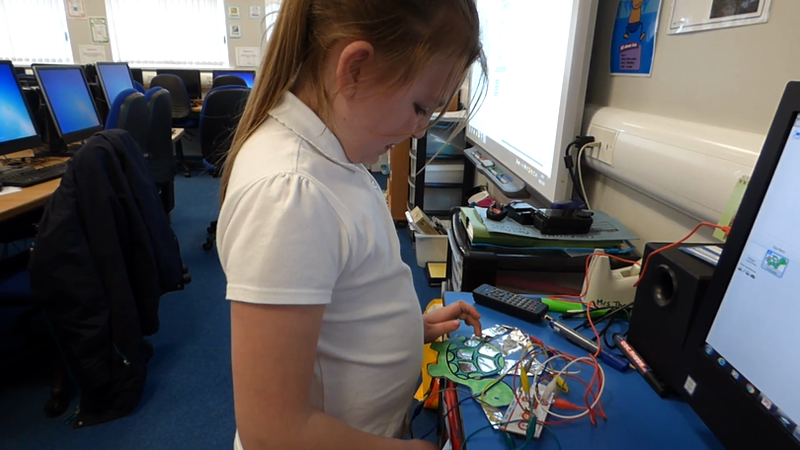 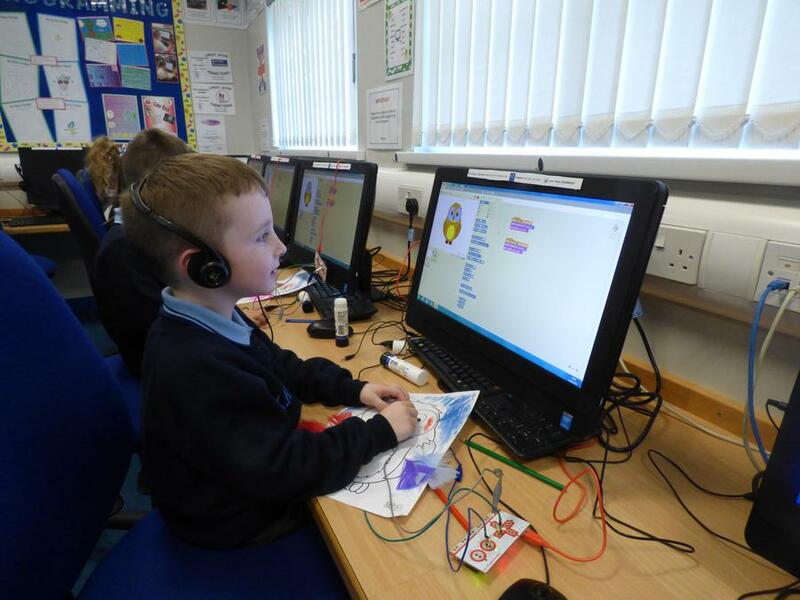 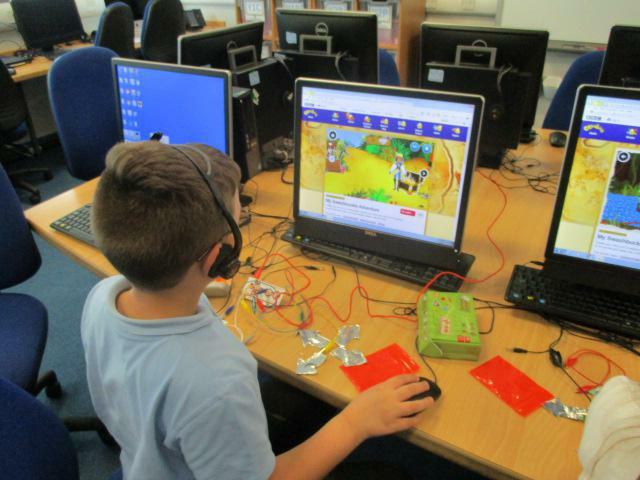 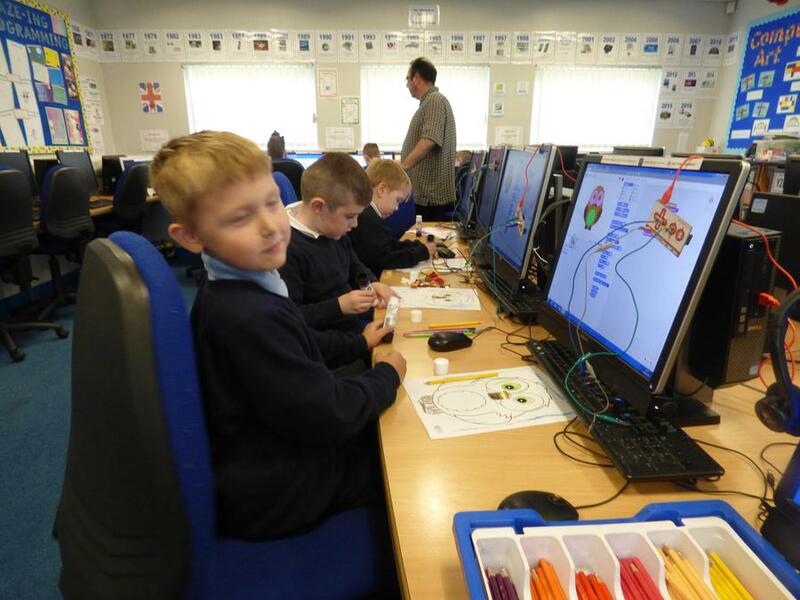 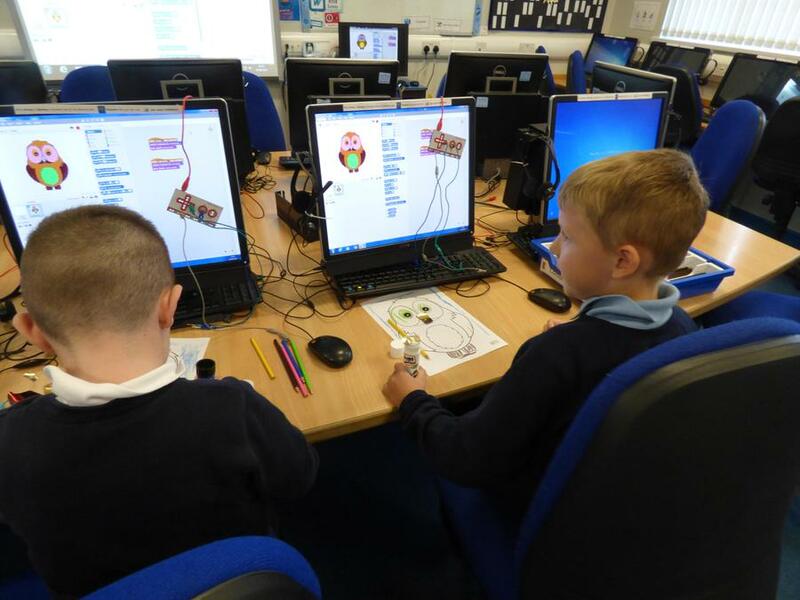 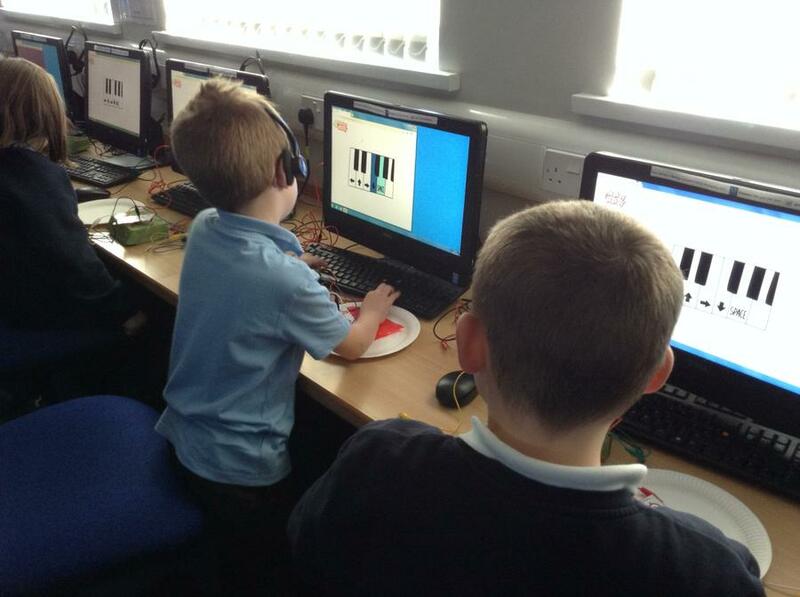 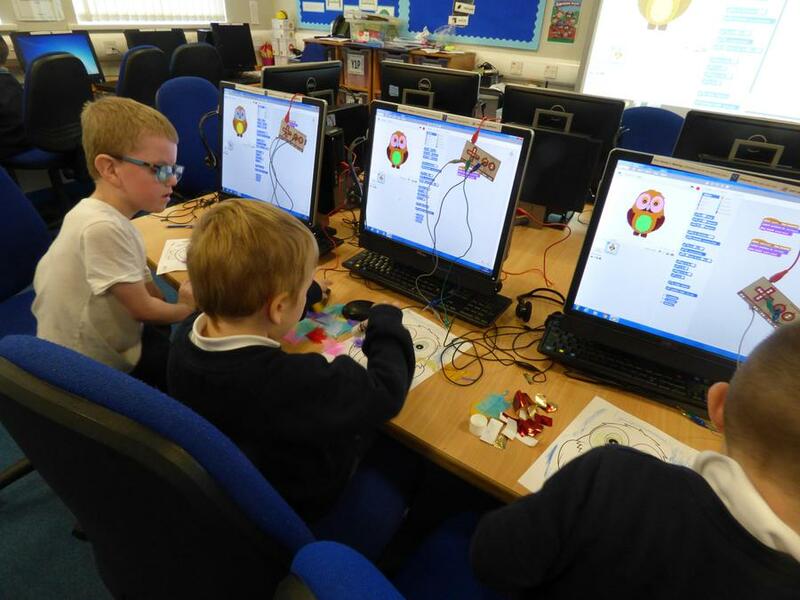 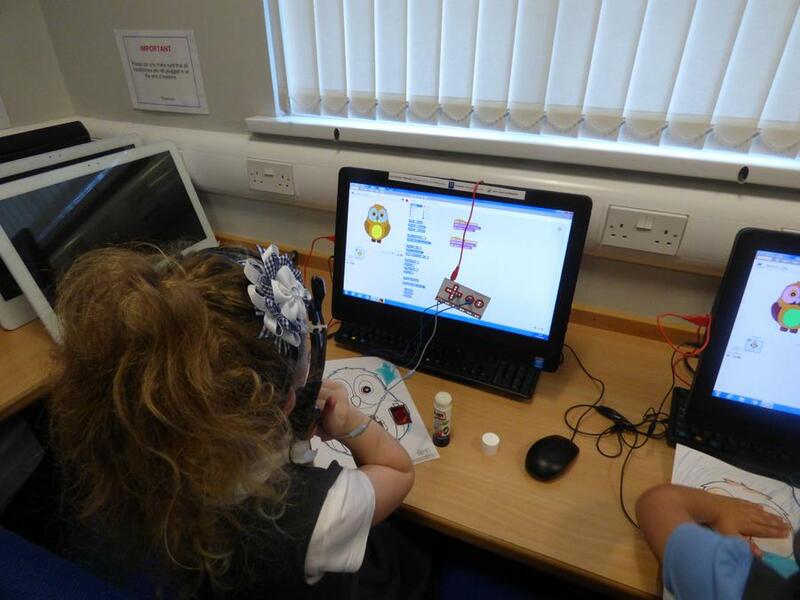 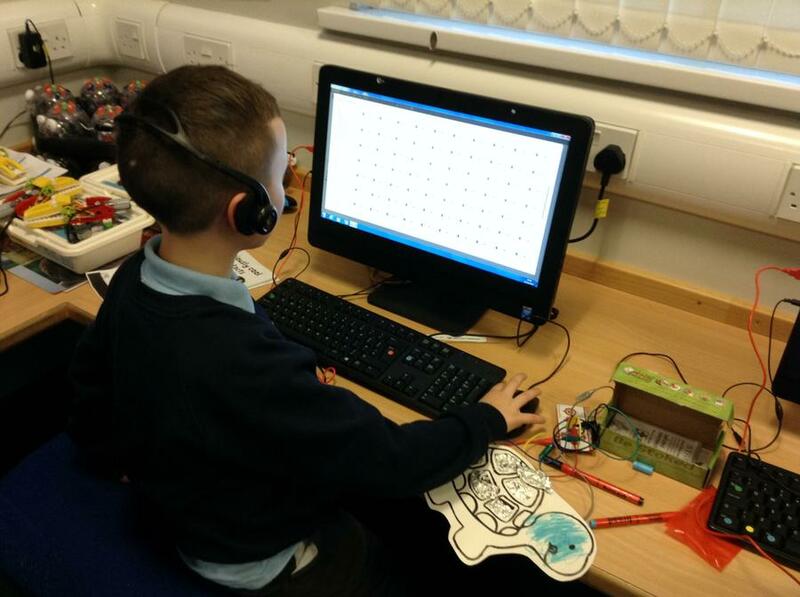 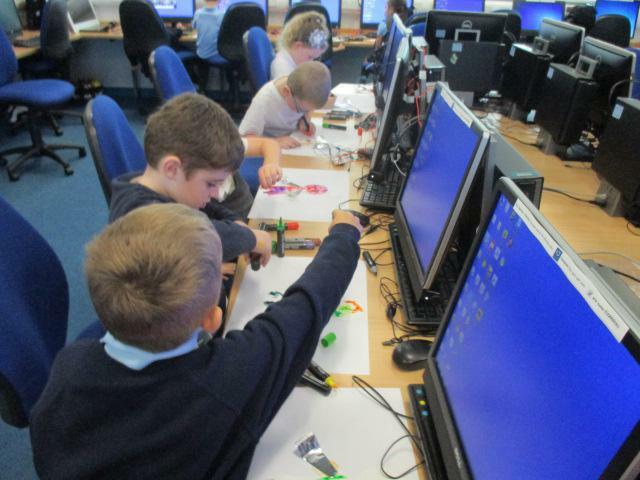 This week, children used the controls they had made from the first week to experiment playing games that used up,down, left and right controls. 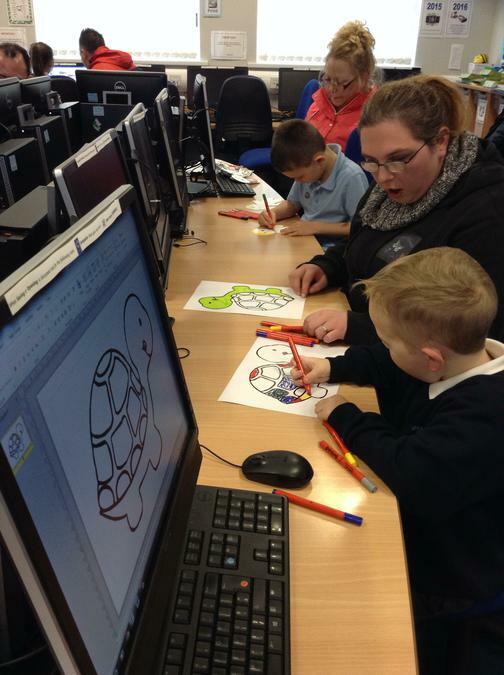 Children were given a picture of a tortoise with 5 parts of its shell missing. 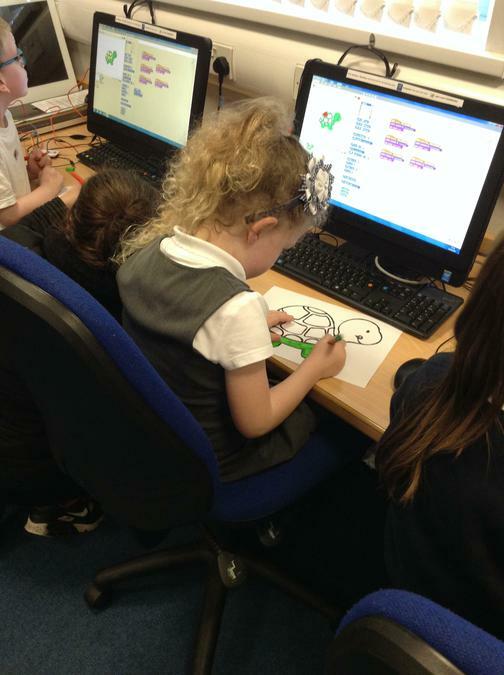 Children coloured the tortoise in and attached foil over the missing parts. 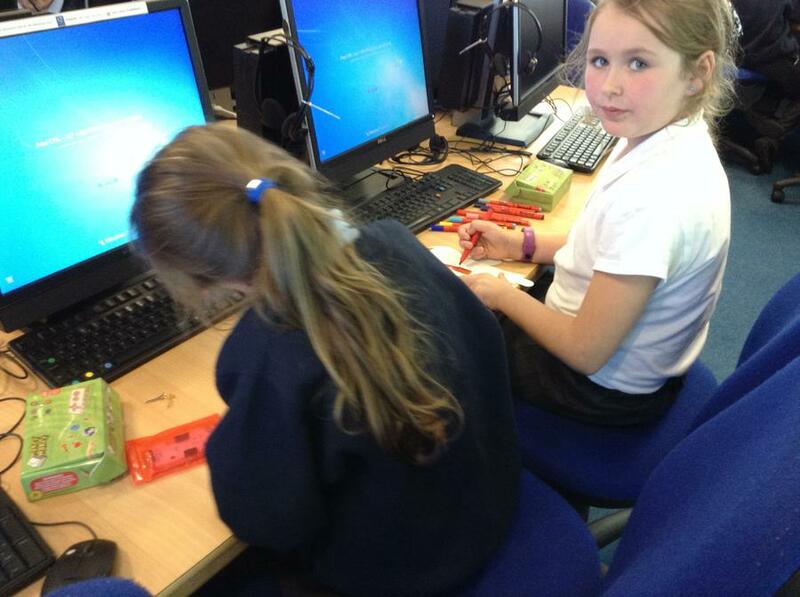 Once the foil was in place children attached the crocodile clips to the foil using paperclips to secure a hold. 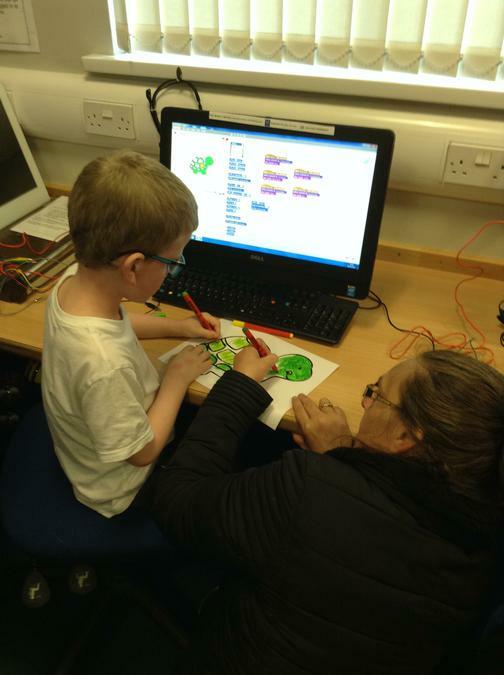 Children opened a Scratch program linked to the tortoise, when children touched parts of the shell it made different sounds. 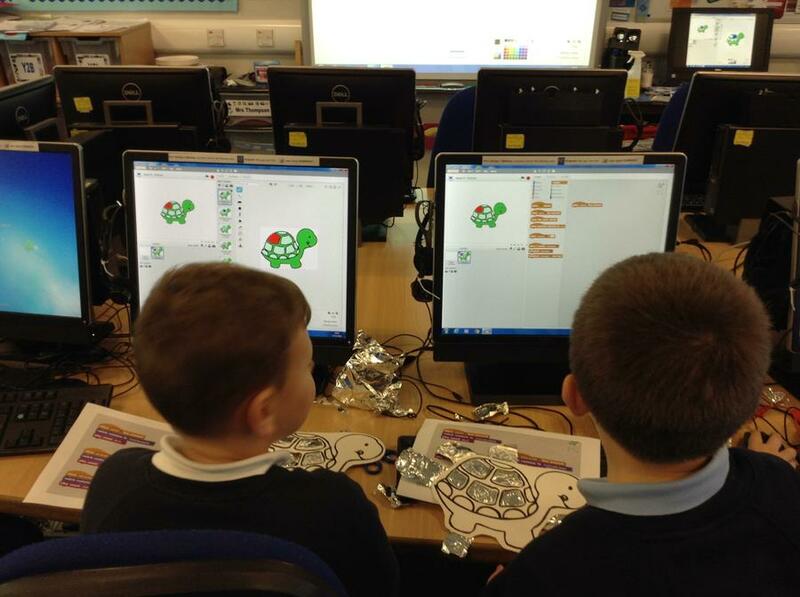 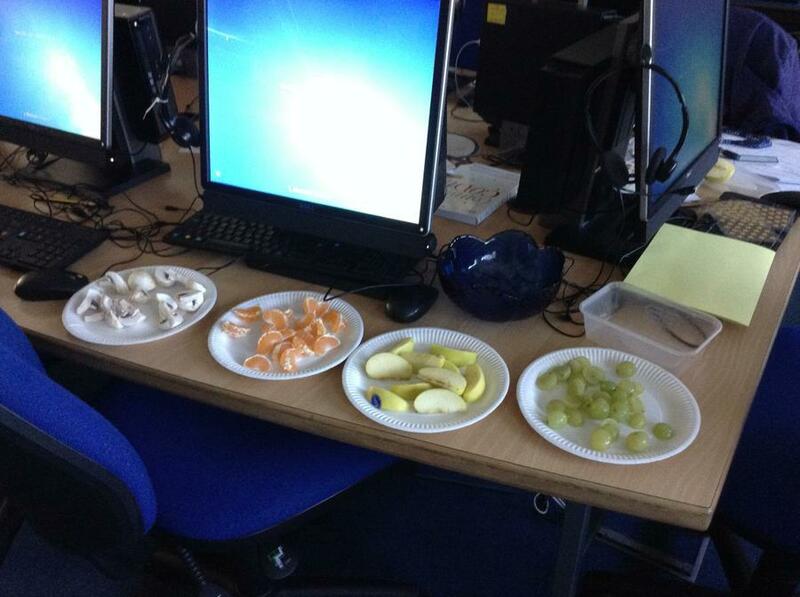 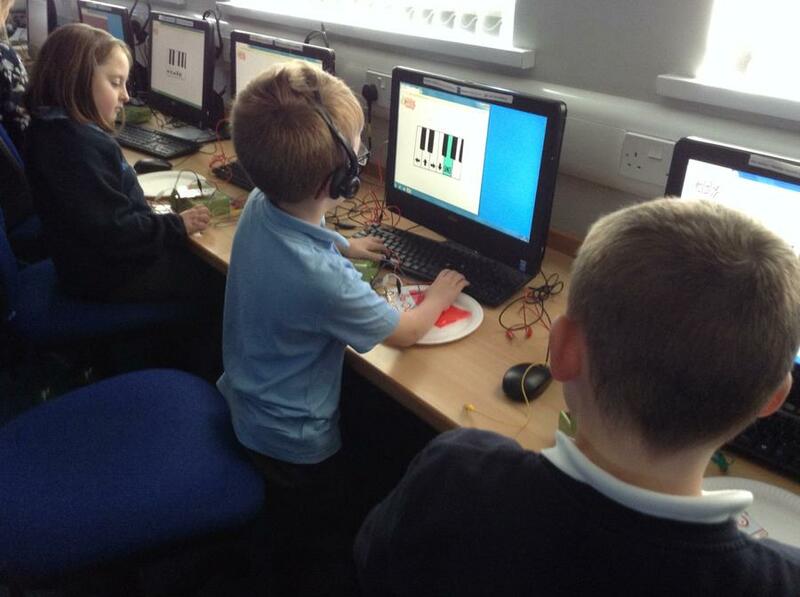 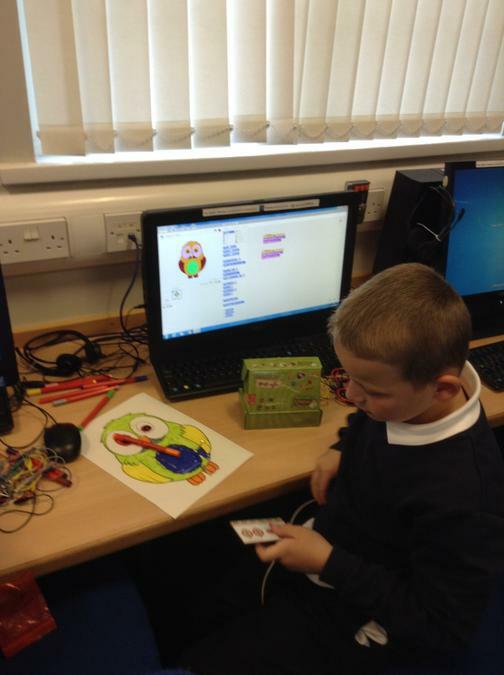 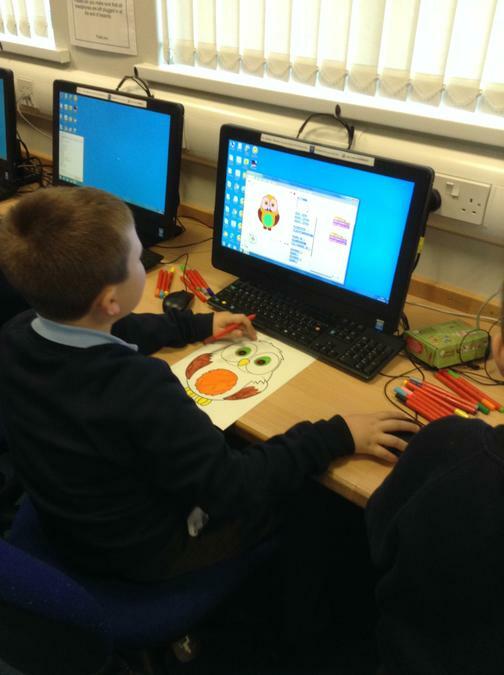 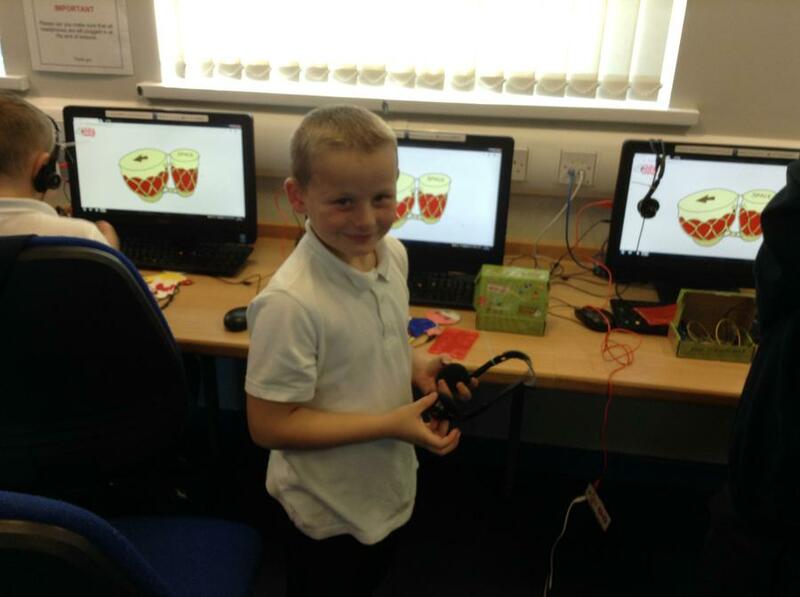 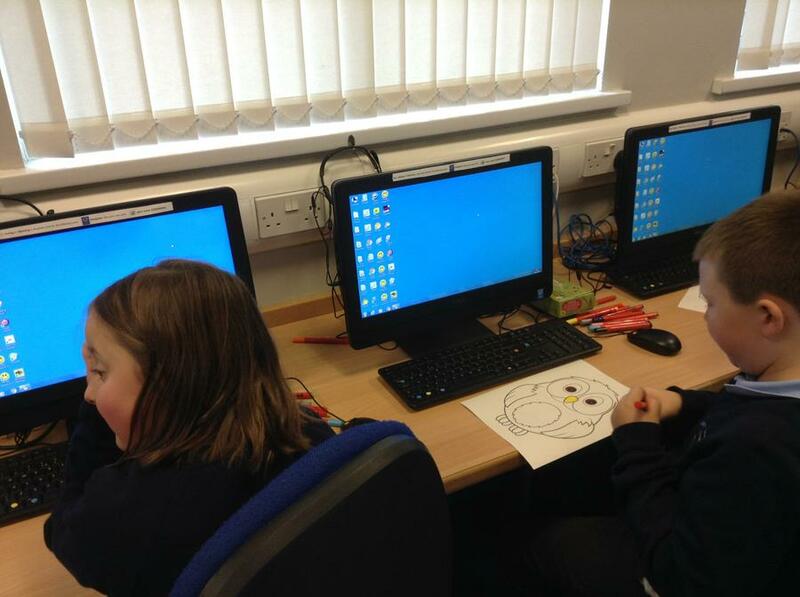 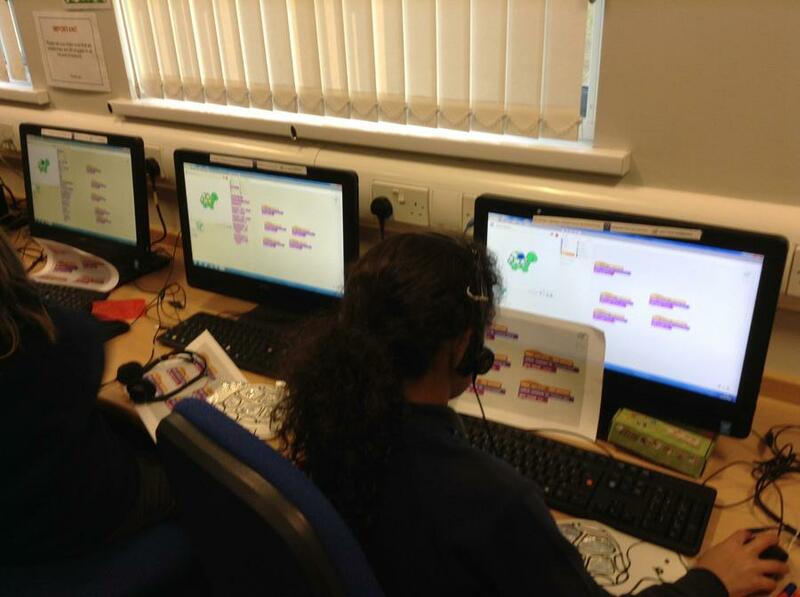 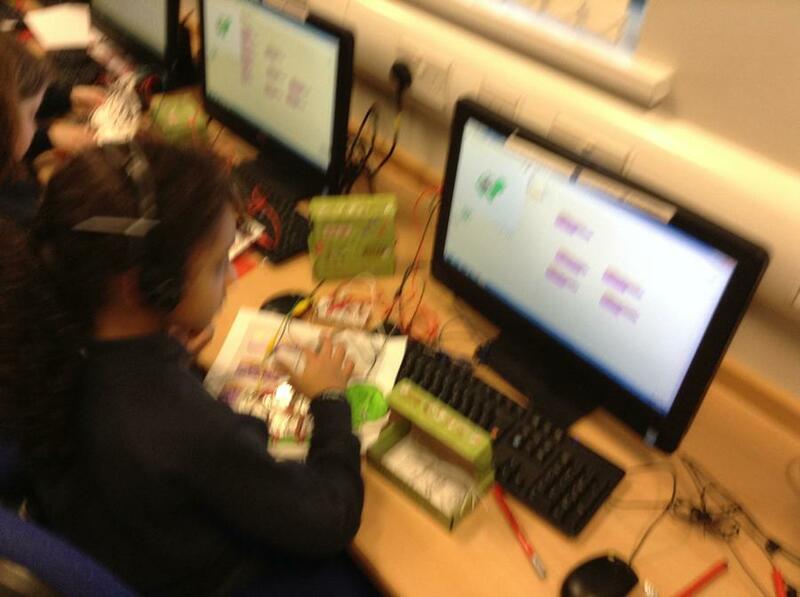 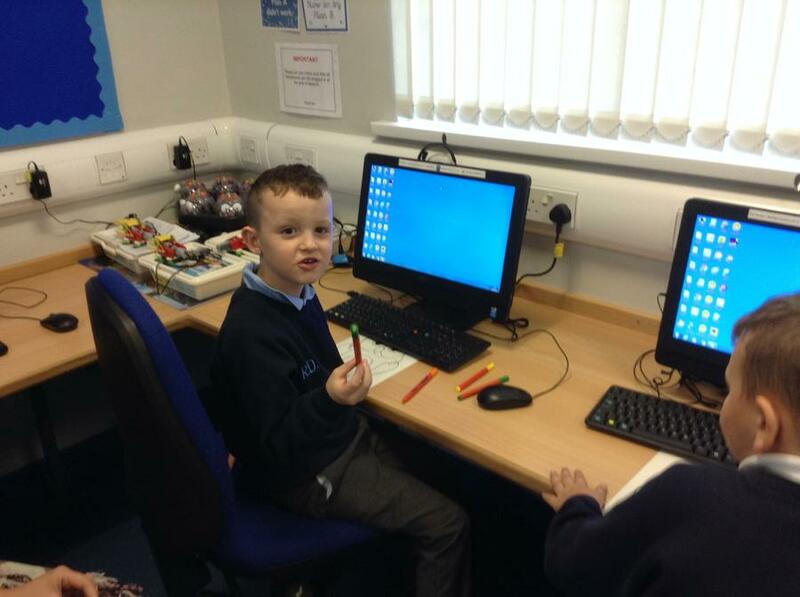 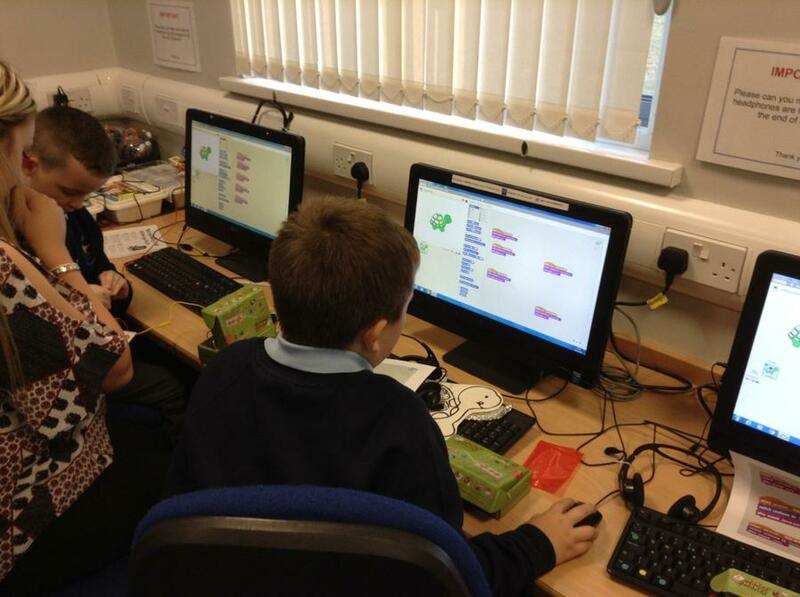 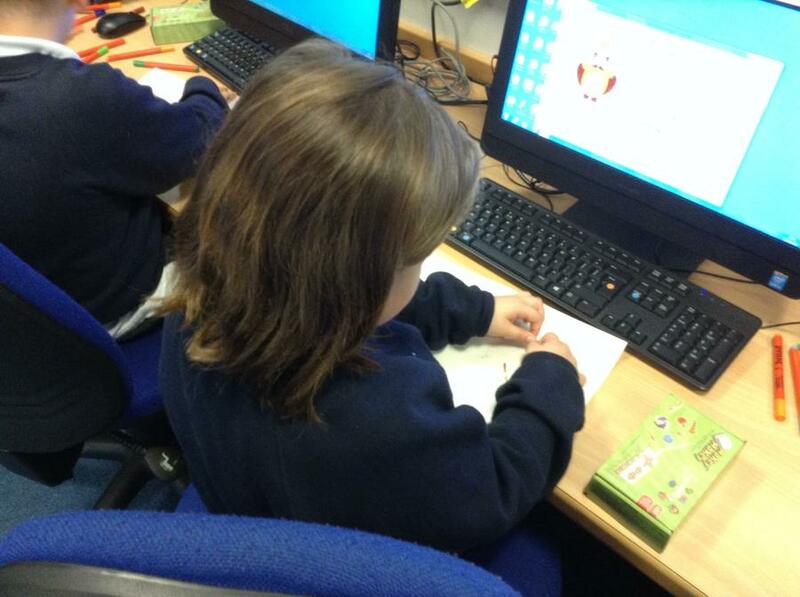 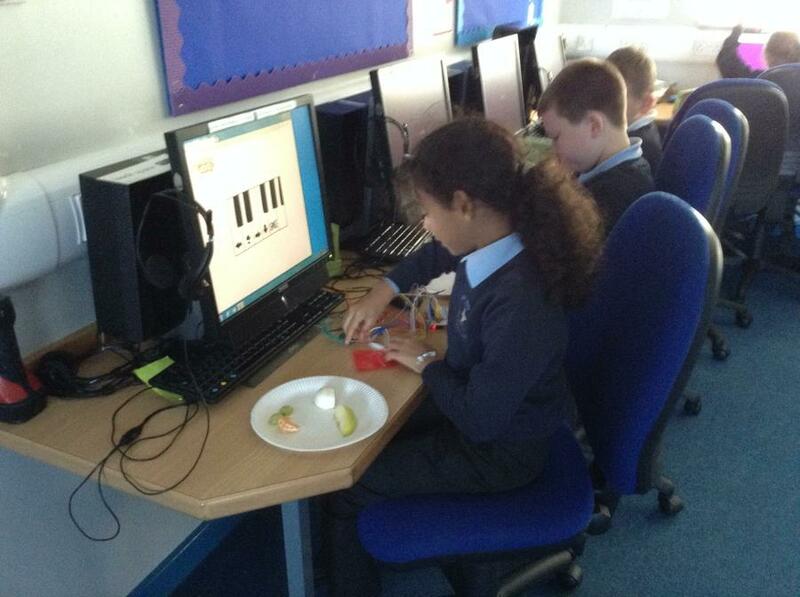 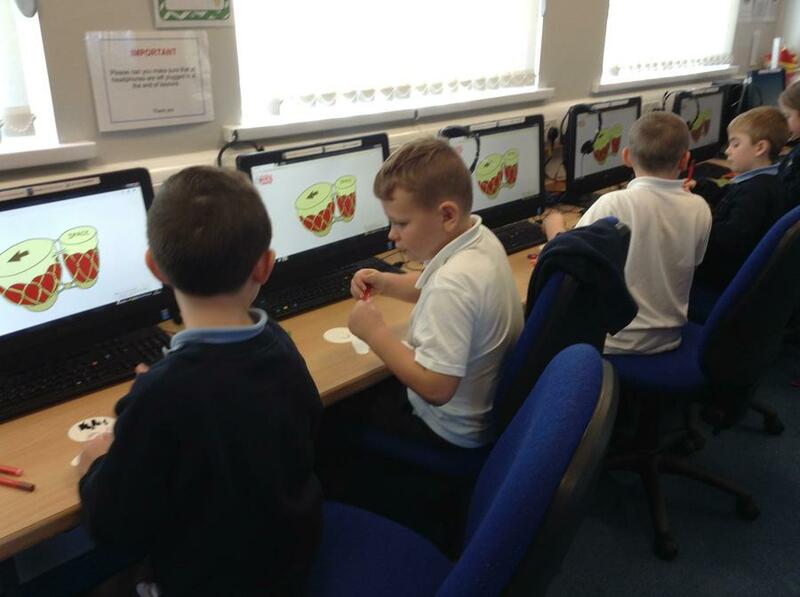 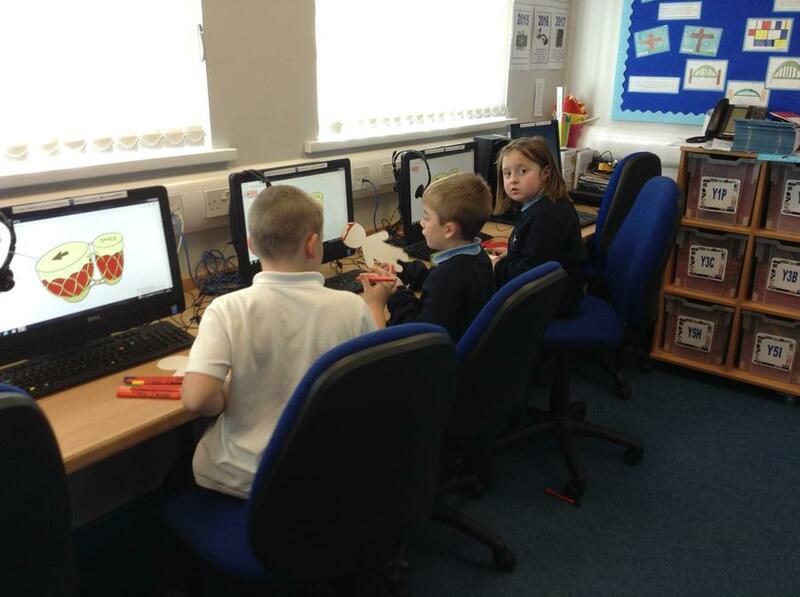 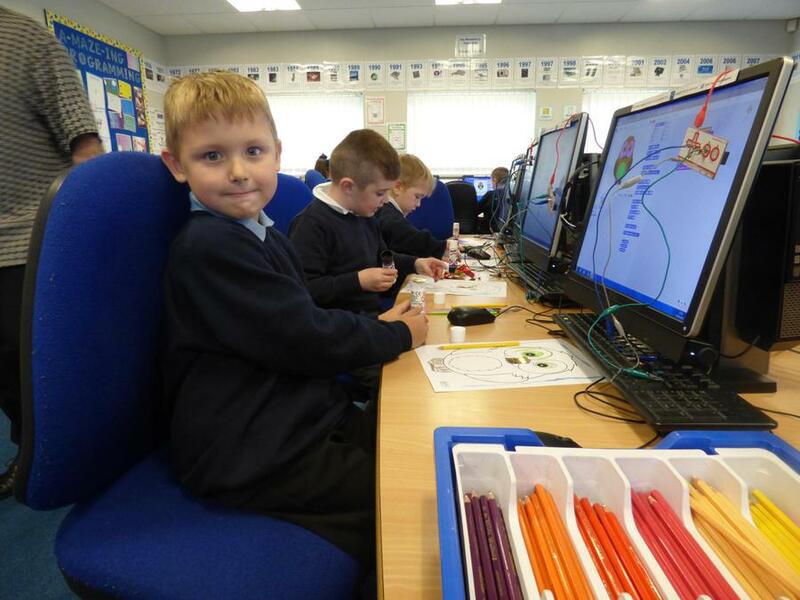 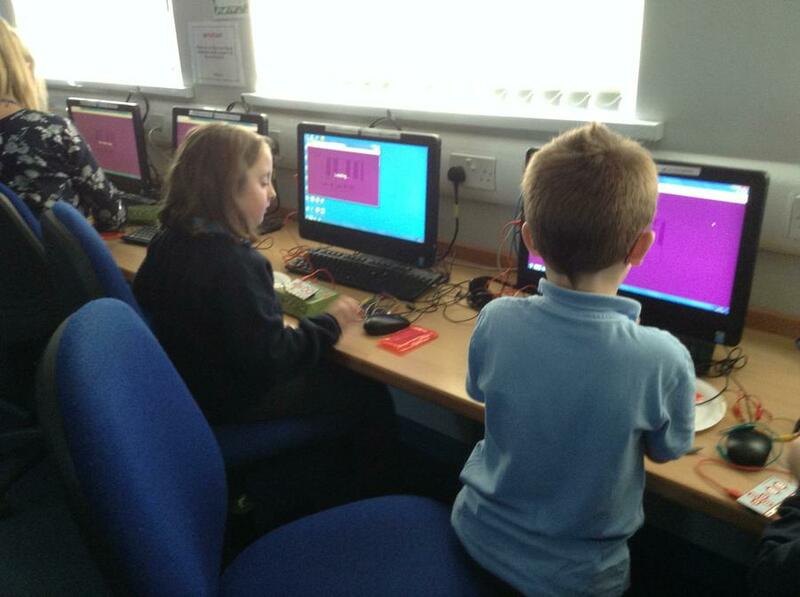 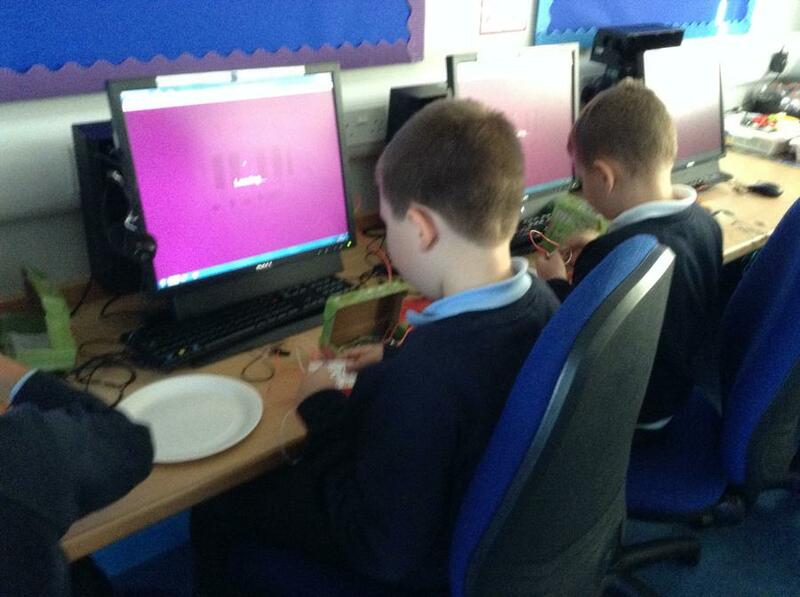 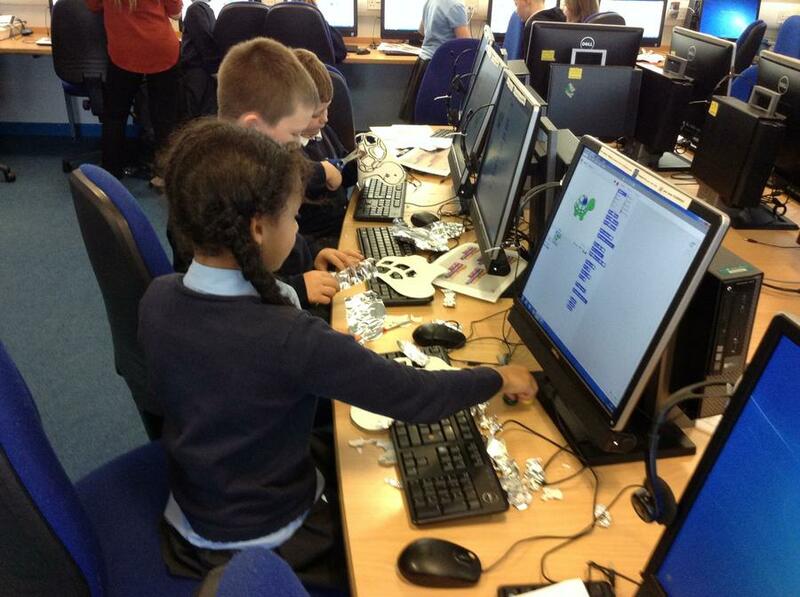 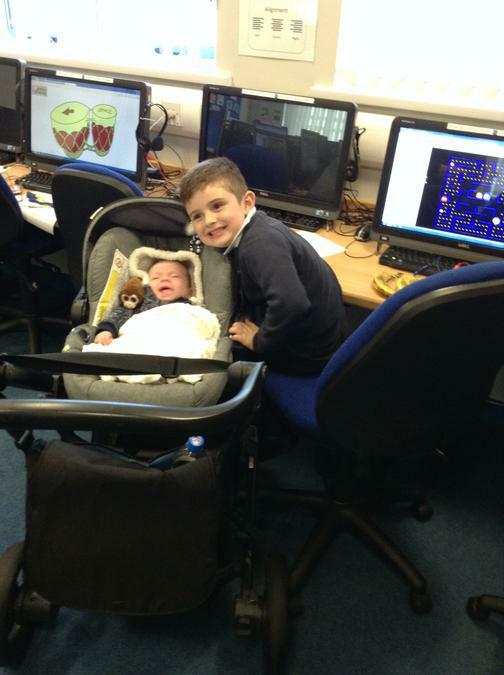 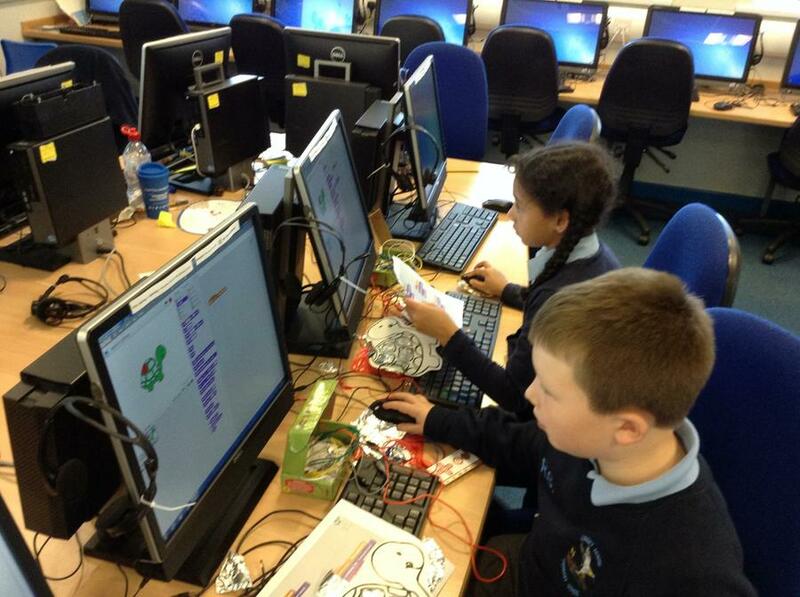 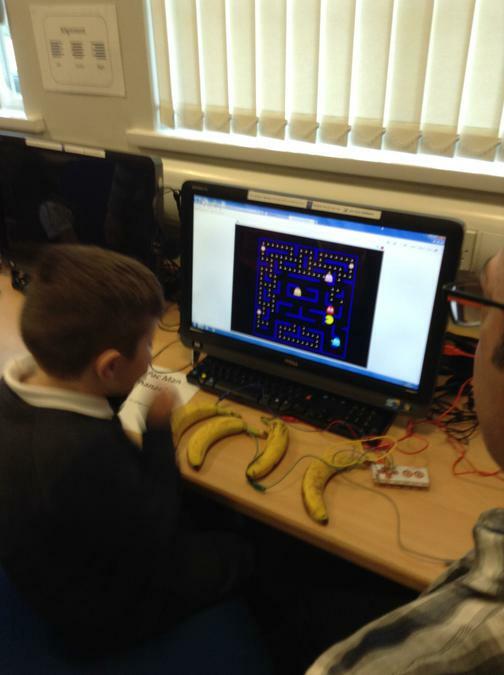 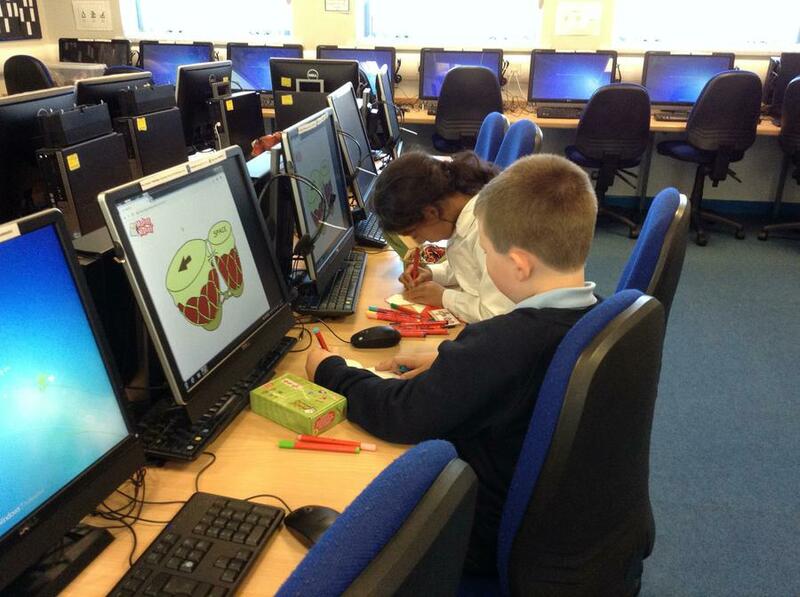 This week we have been using fruit to create game controls. 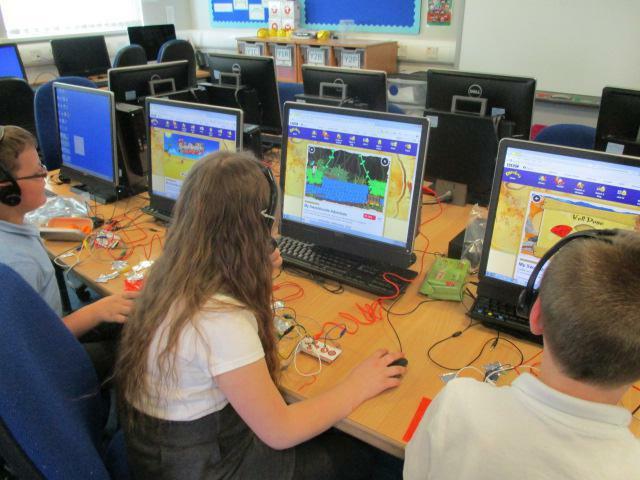 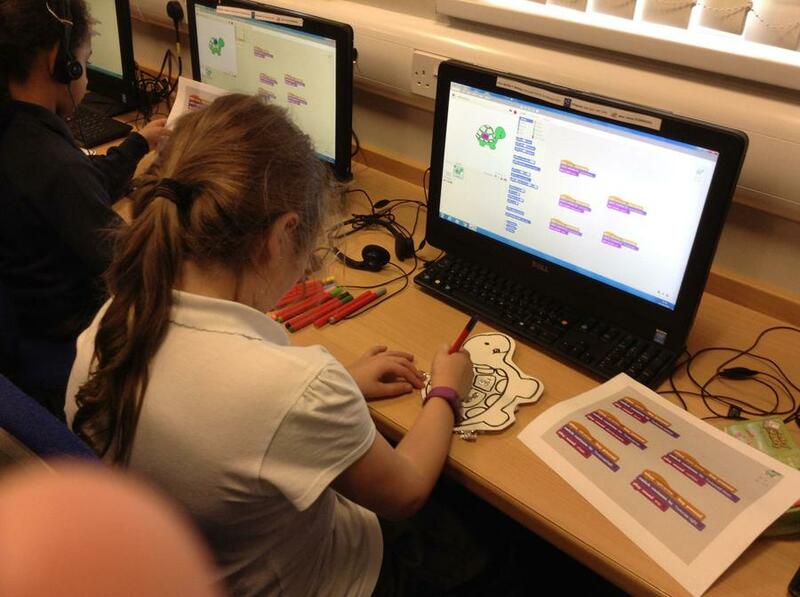 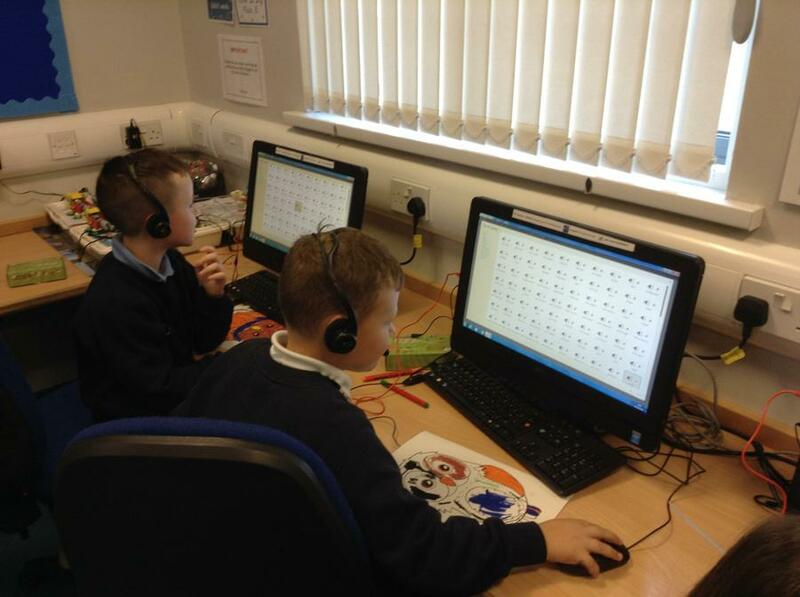 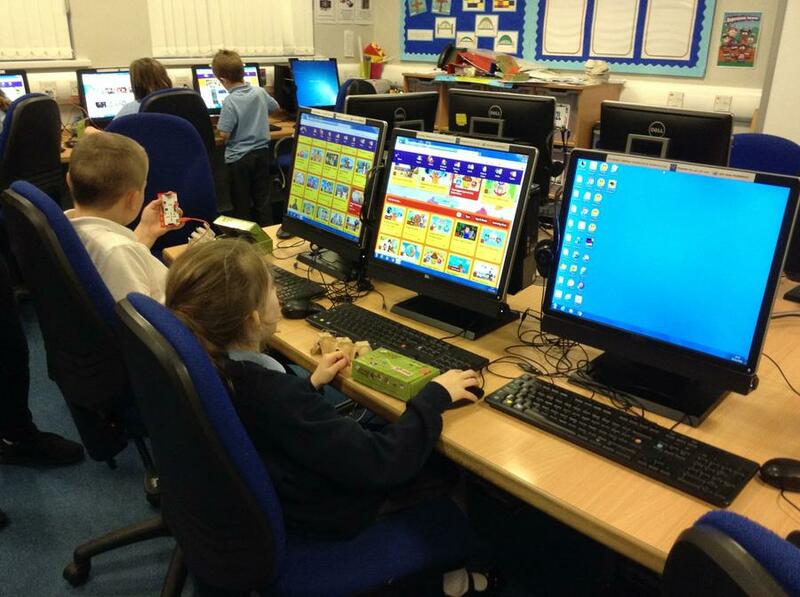 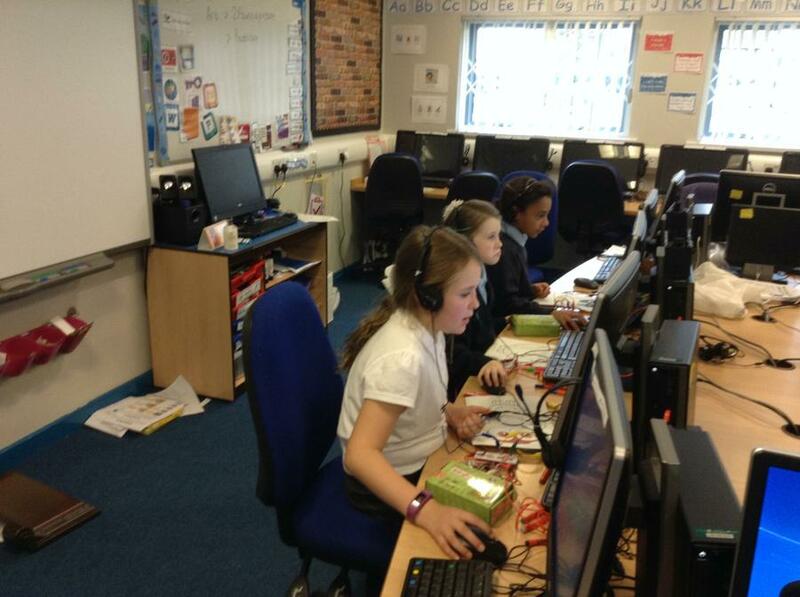 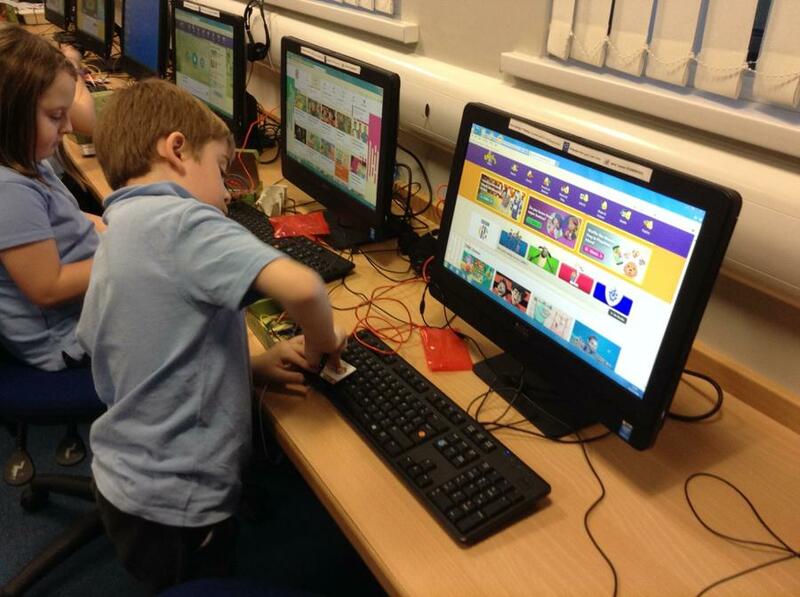 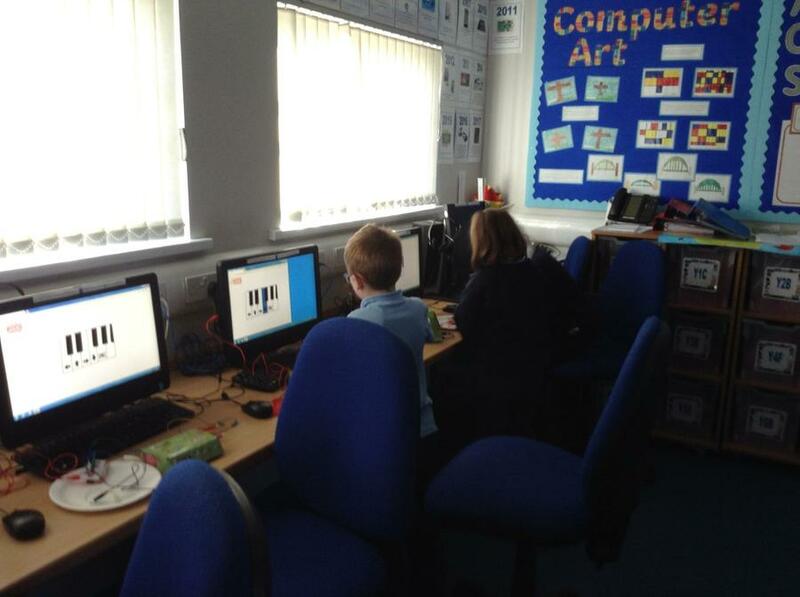 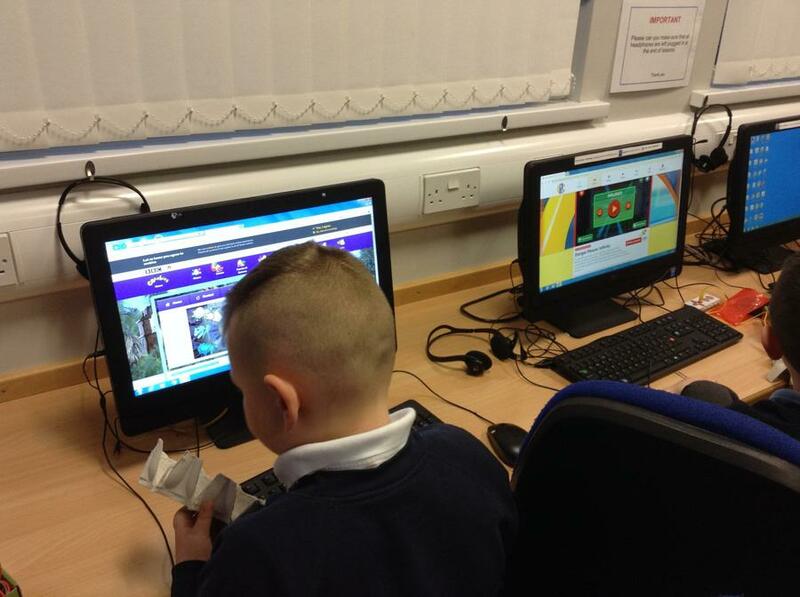 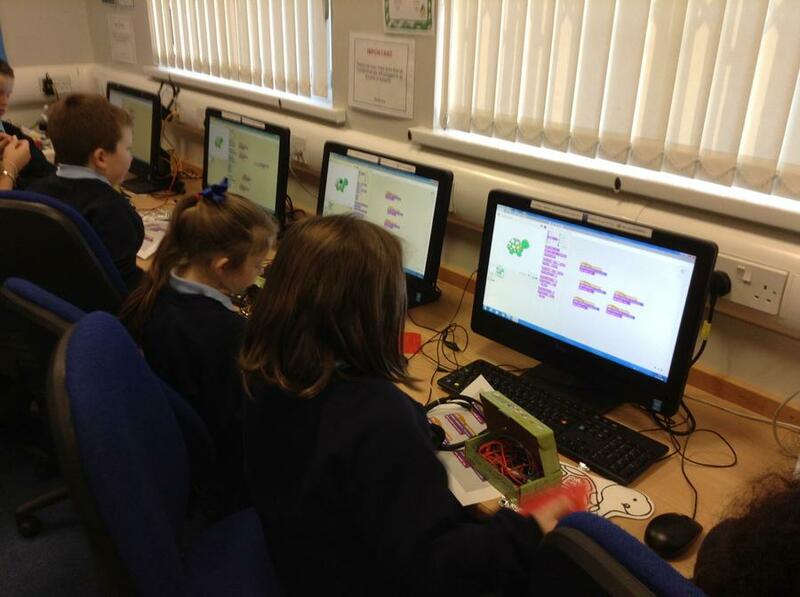 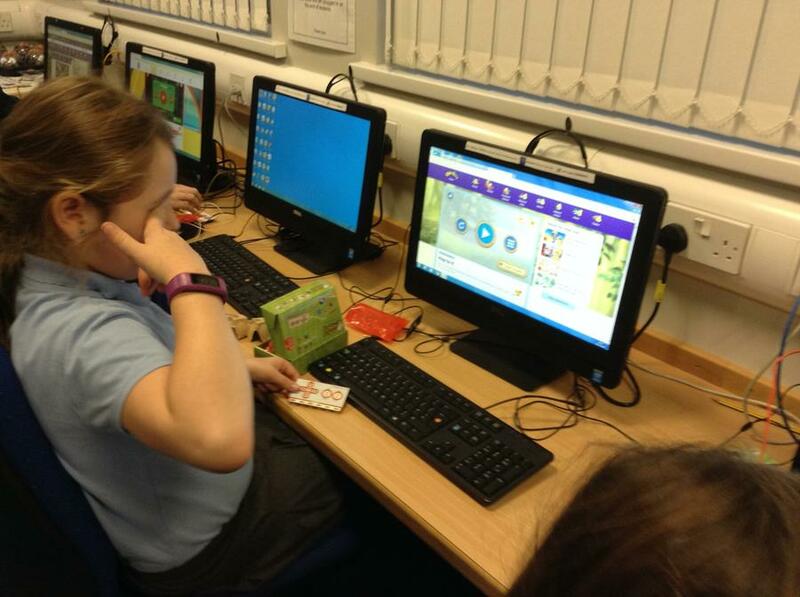 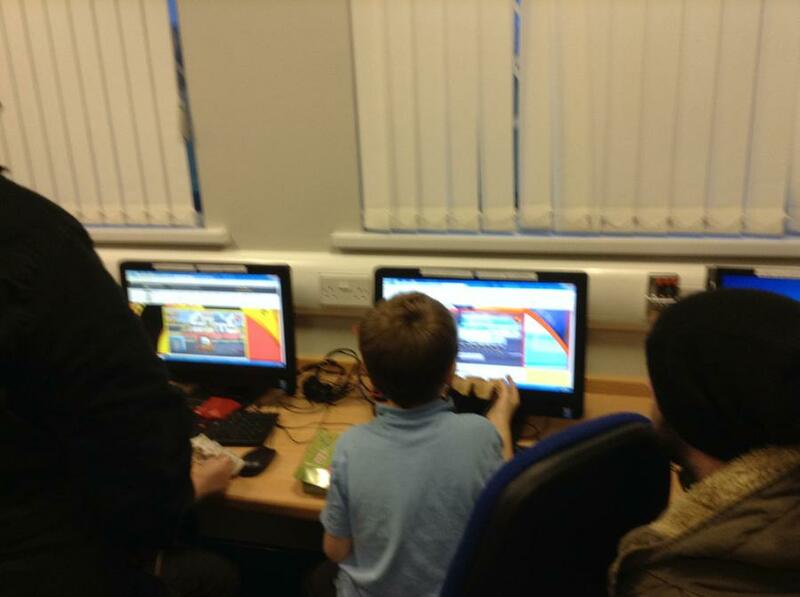 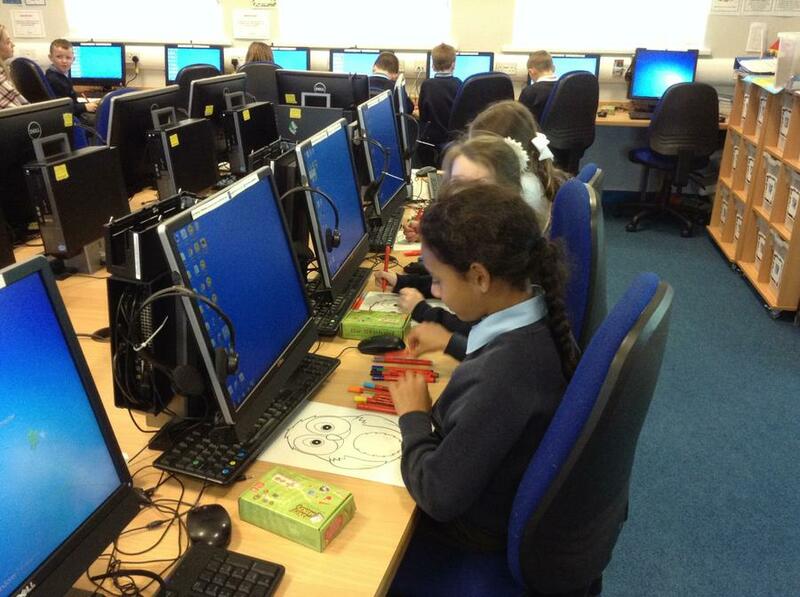 We using the cbbc website games and used our new controls. 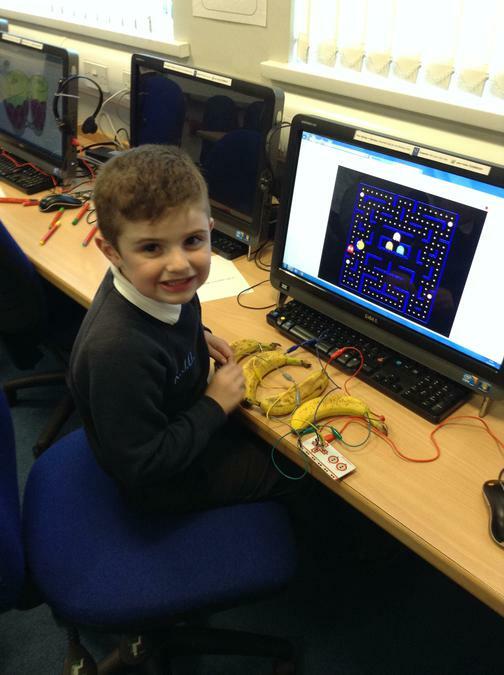 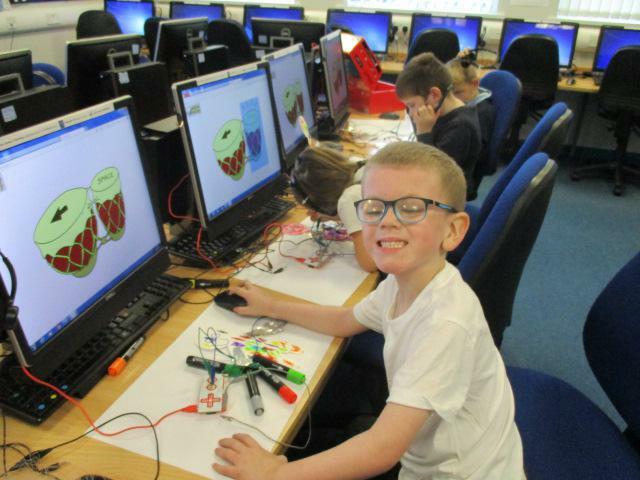 Week 3 - Create fruit controls to play games. 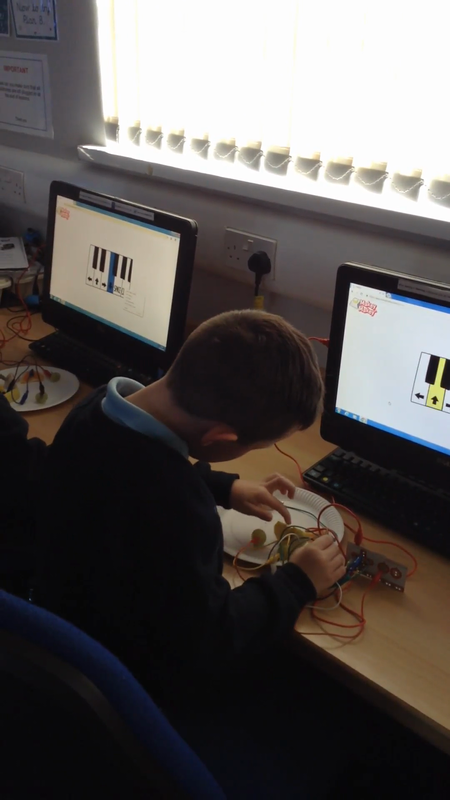 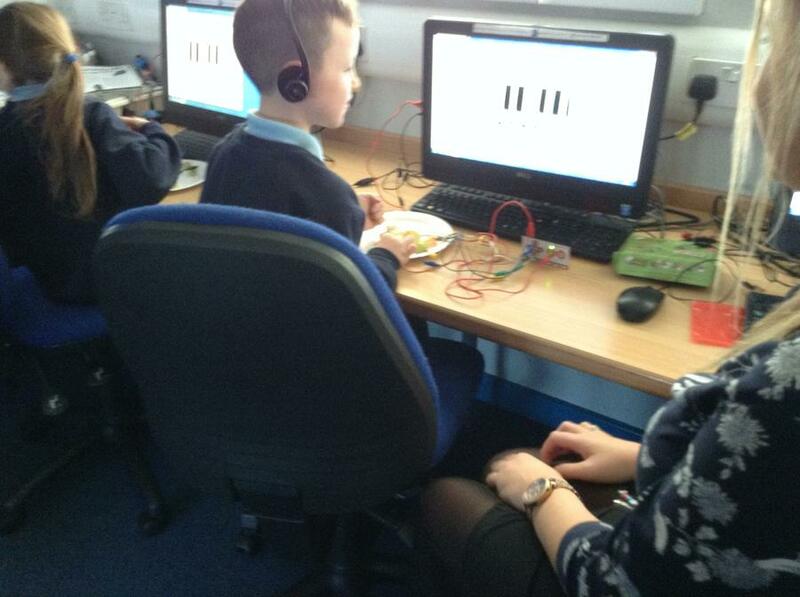 This week we set up our MaKey MaKey circuits to play the piano. 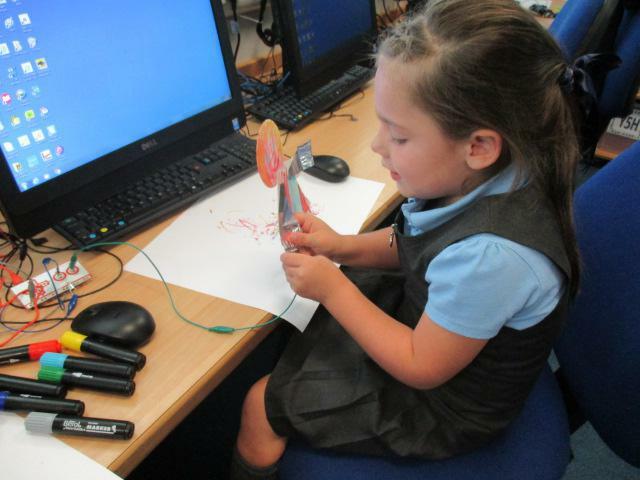 We drew some arrows on a whiteboard and then used play-doh to make our keys. 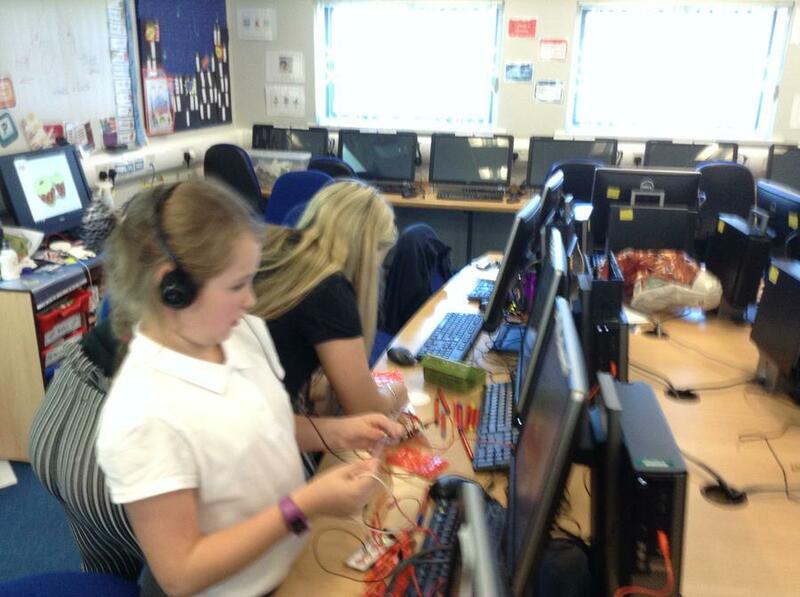 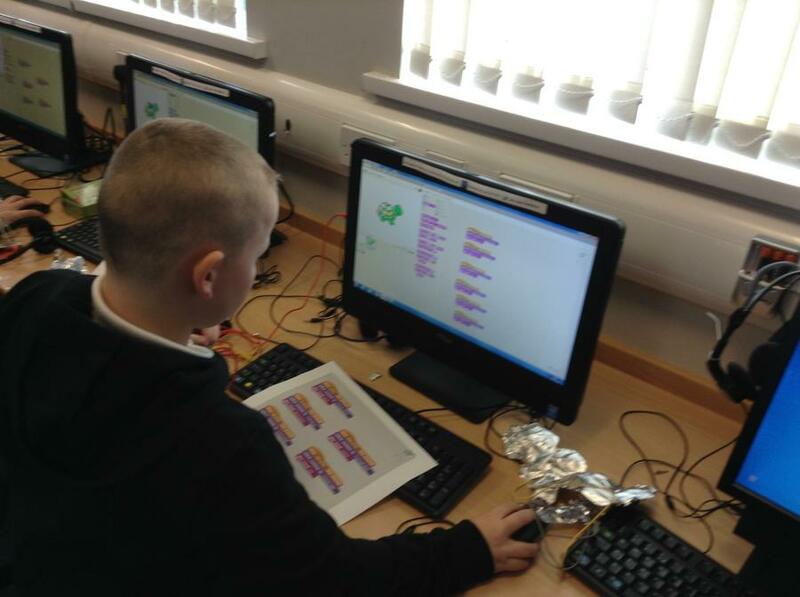 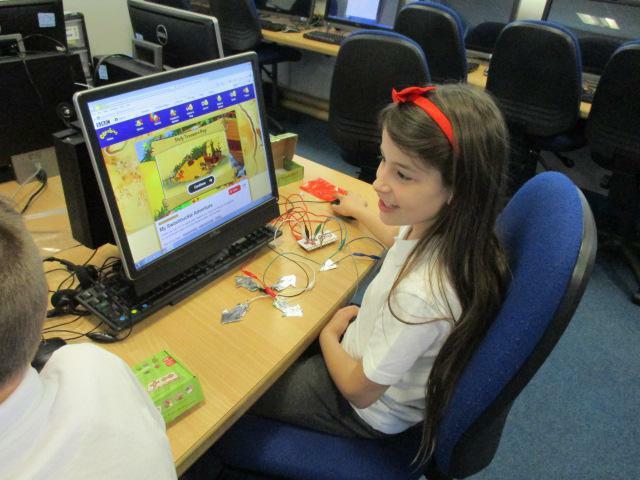 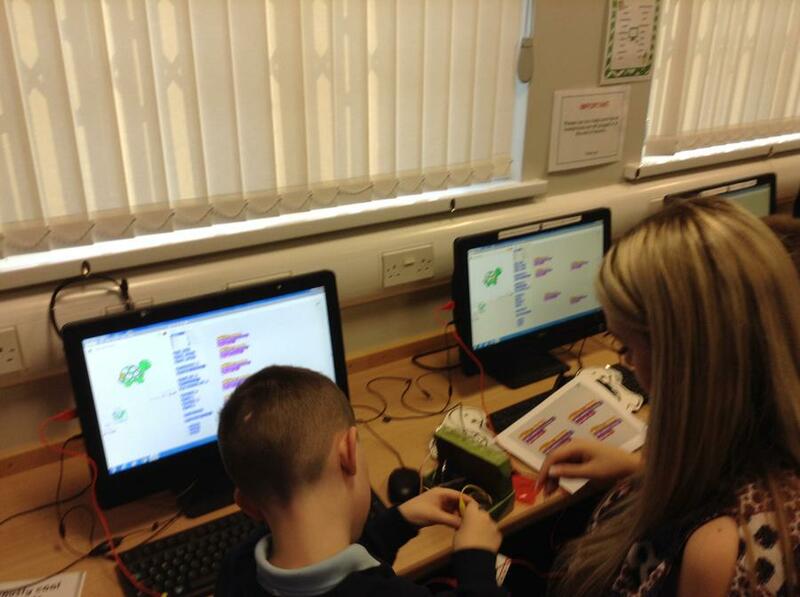 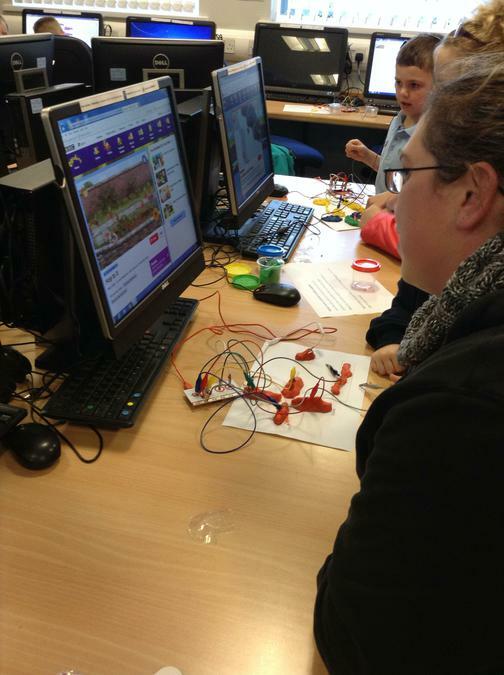 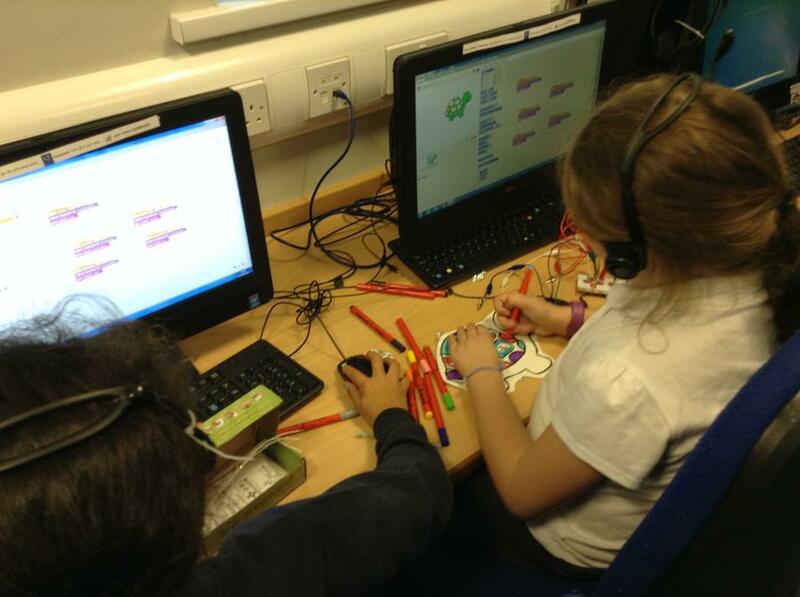 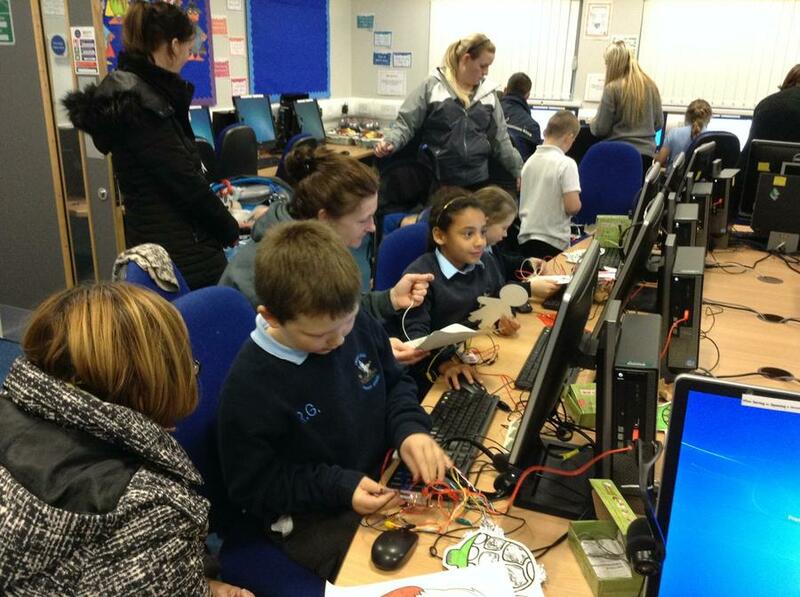 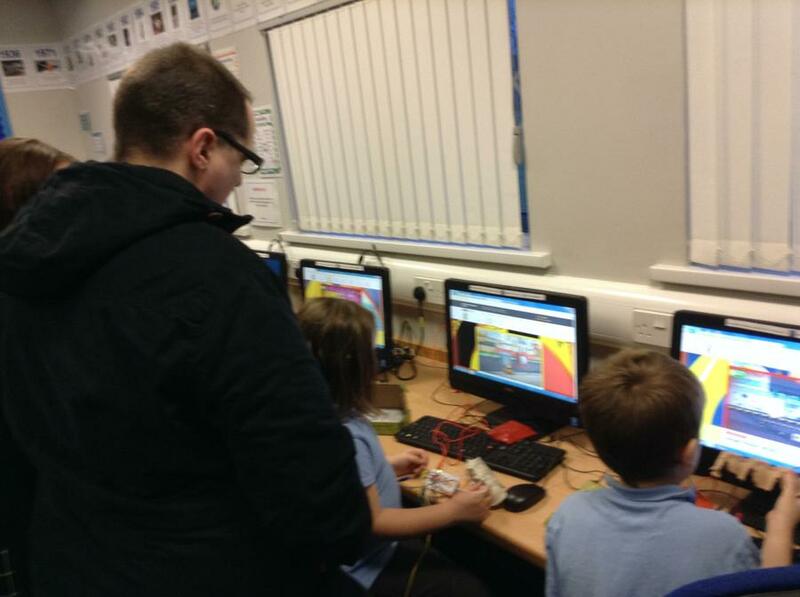 Tonight was our first session at our Makey Makey IT Club. 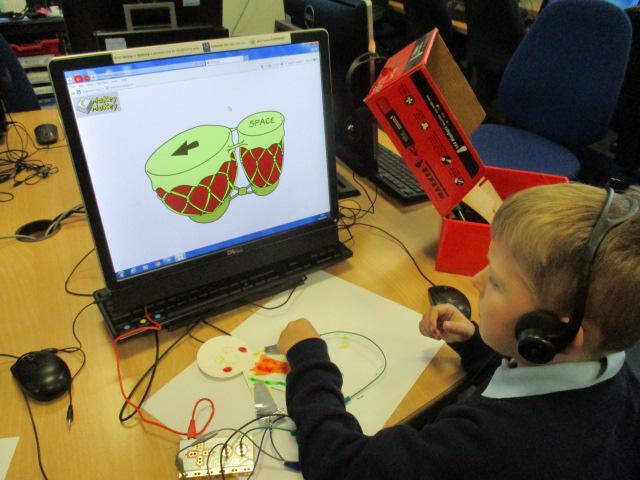 Our first challenge was to play the Bongos. 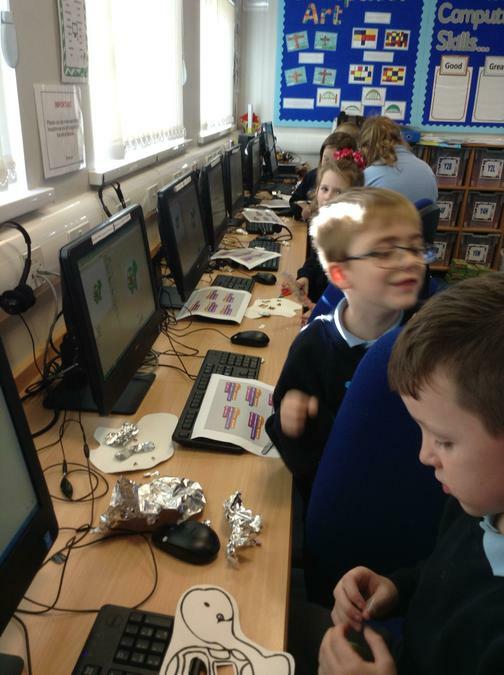 To play the Bongos we had to create some controls, children covered card arrows with tin foil and then got the kit out of the box. 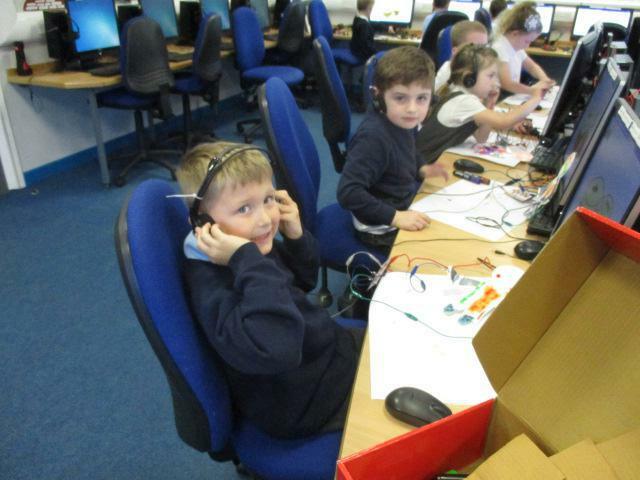 They connected the crocodile clips to the controls they had made and then connected them to the circuit board. 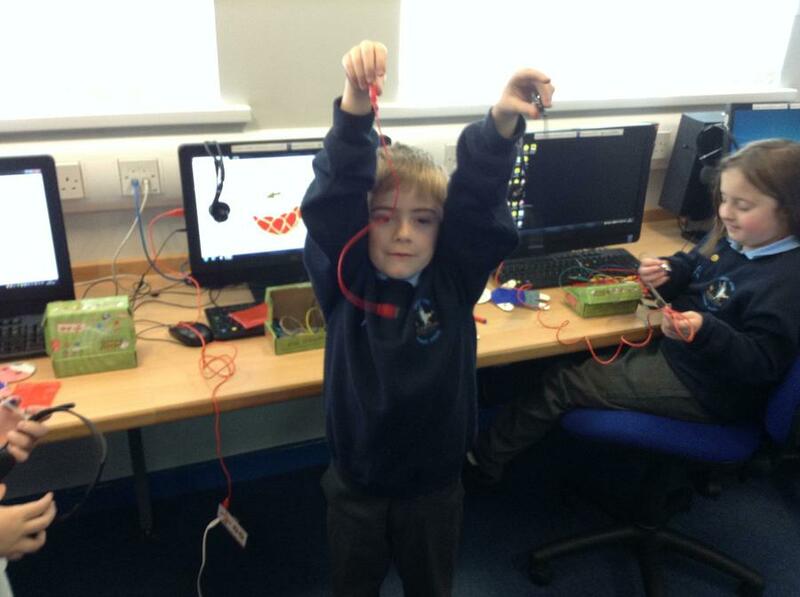 The children had to complete the circuit by touching the earth cable.